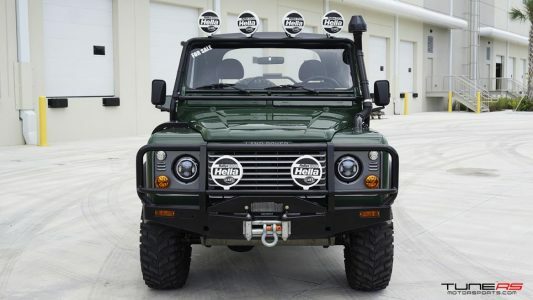 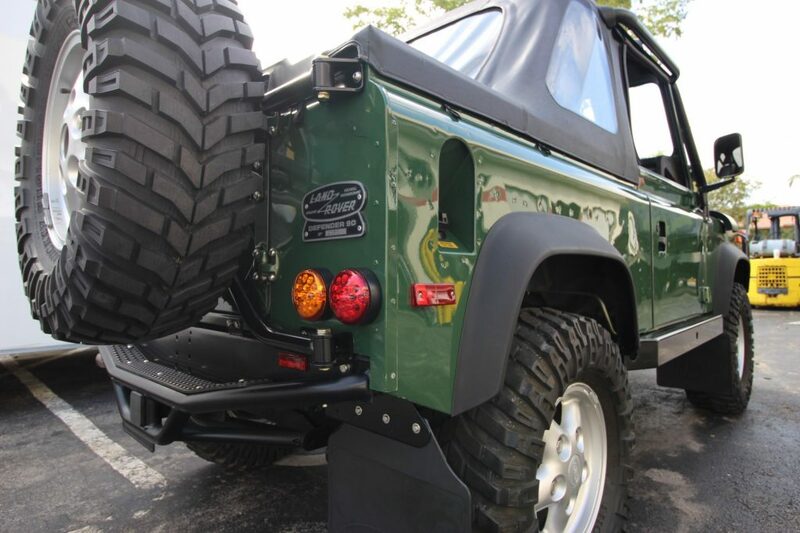 Defender 90 #2170 has been professionally revived by TuneRS Motorsports out of Coral Springs, Florida. It is an original North America Spec LRDEF90 that has been meticulously refreshed and upgraded for the passionate enthusiast. 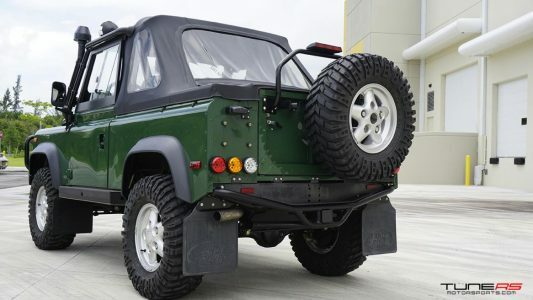 Rust free body and chassis, original frame with I.D. 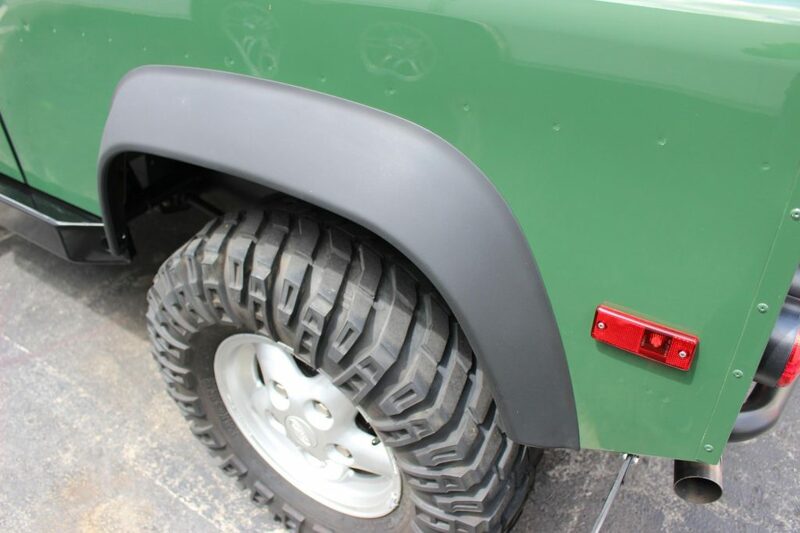 stamped, straight body and almost all original paint. #2170 is a stunning example of how a real Defender 90 should look and perform. Every piece of the exterior hardware has been replaced with stainless and all undercarriage hardware re-plated and heat treated to ensure a rust-protection future. 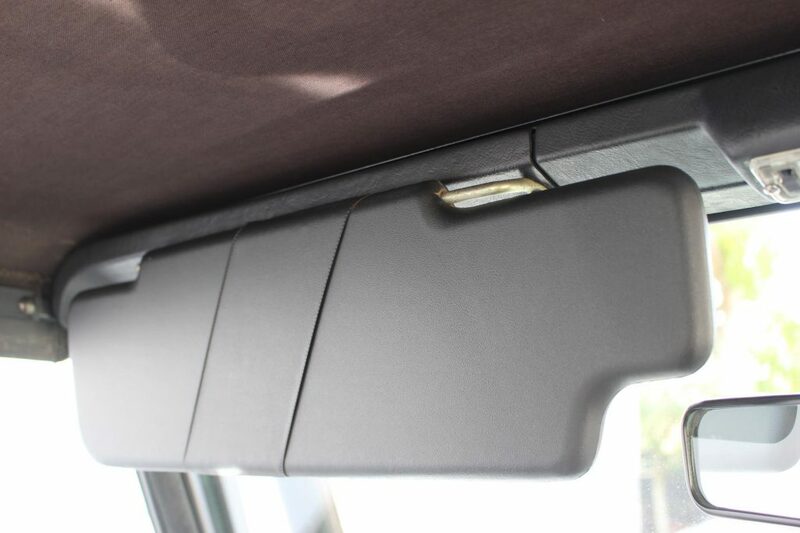 The paint has been polished & ceramic coated to ensure a mirror like finish and protection. 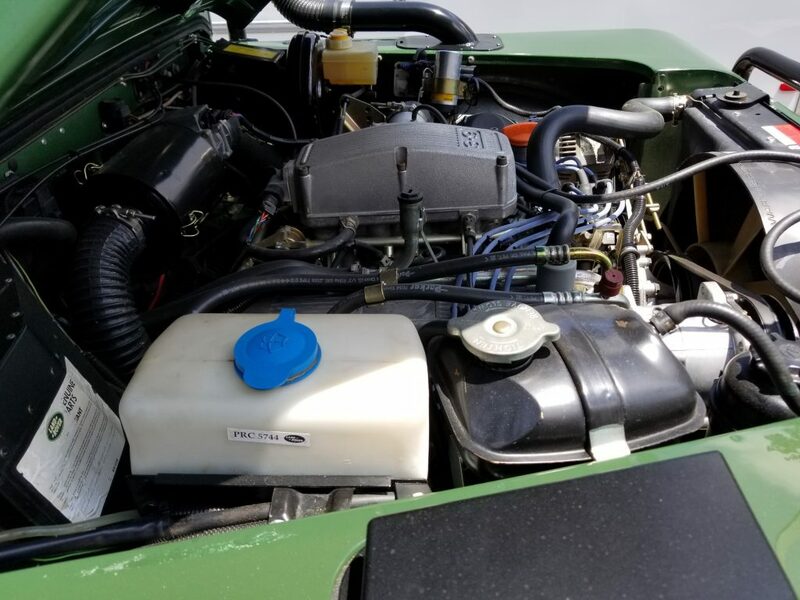 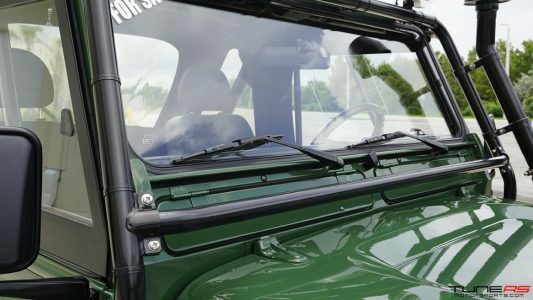 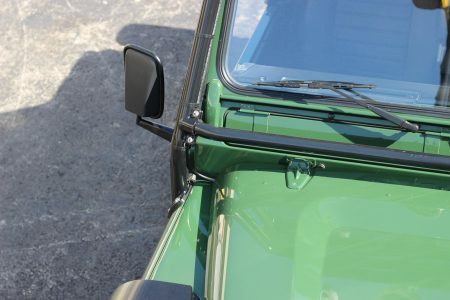 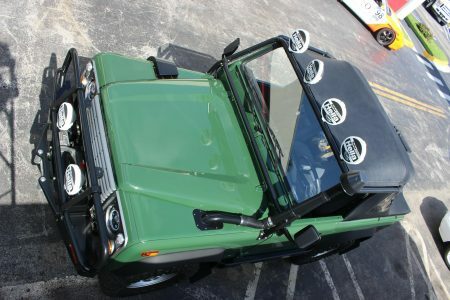 The Coniston green color was only offered on the 94 and 95’ soft top models and 97’ wagons, and the original fastback top produced by Bestop is a very rare option. 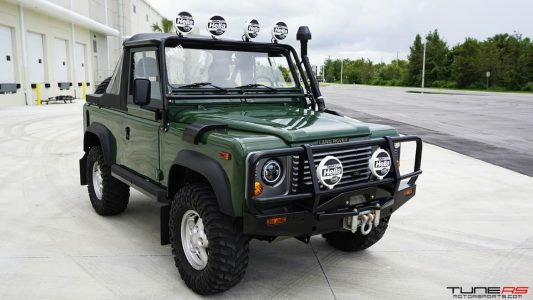 The Defender 90 is a real off-road truck built to withstand the harshest of elements. 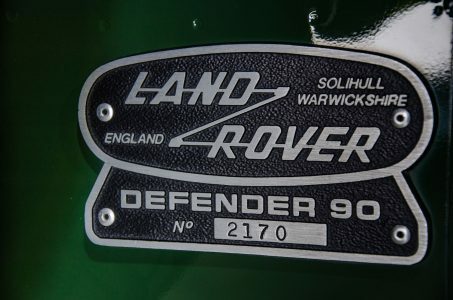 #2170 is as close to a new Defender 90 NAS as you can get, with some modern touches and reliability improvements. 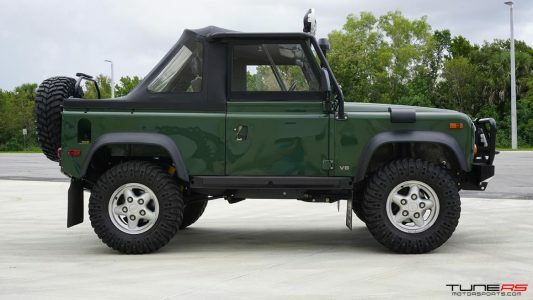 One of 1,190 Defender 90’s built in model year 1995. 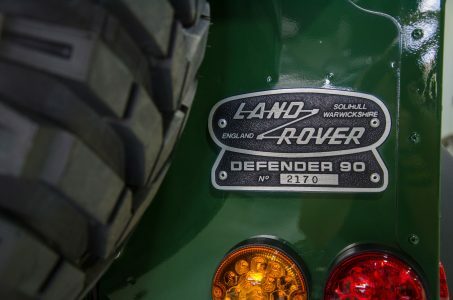 The North America Spec was only available in 1994, 1995 and 1997. 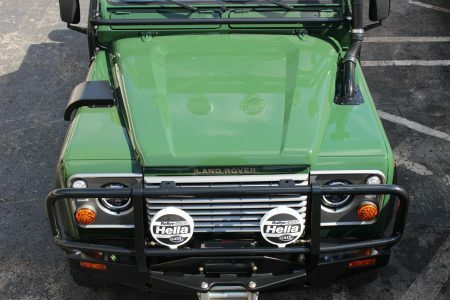 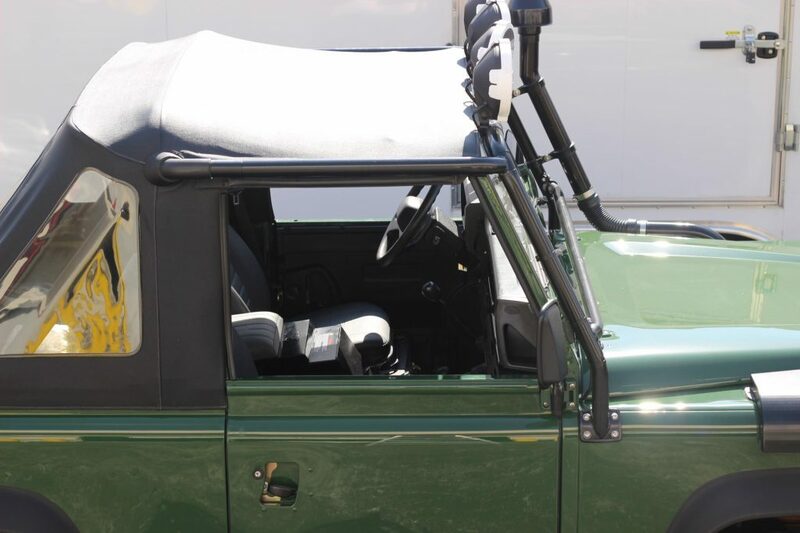 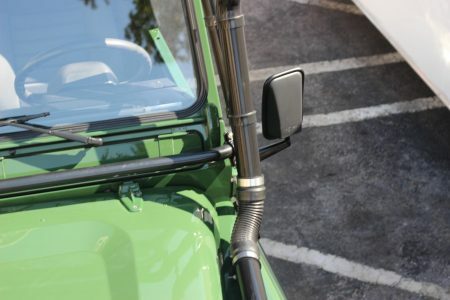 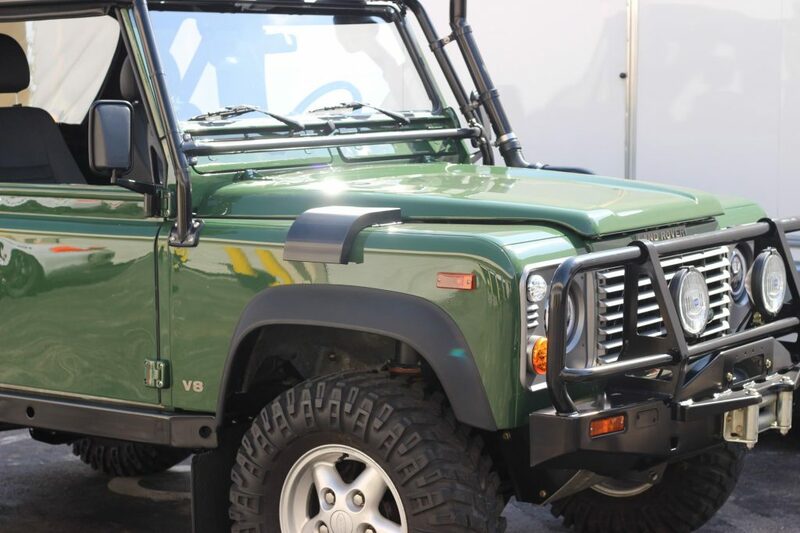 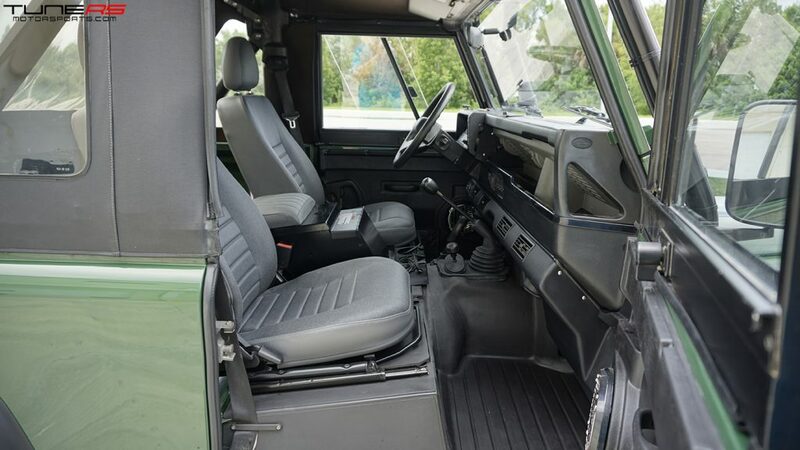 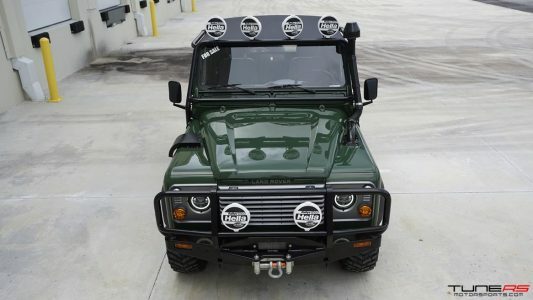 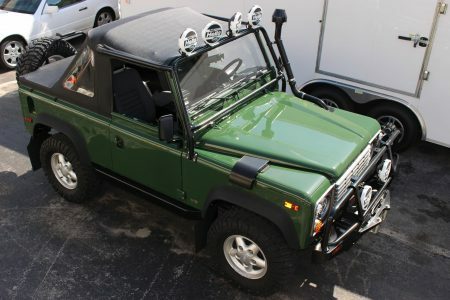 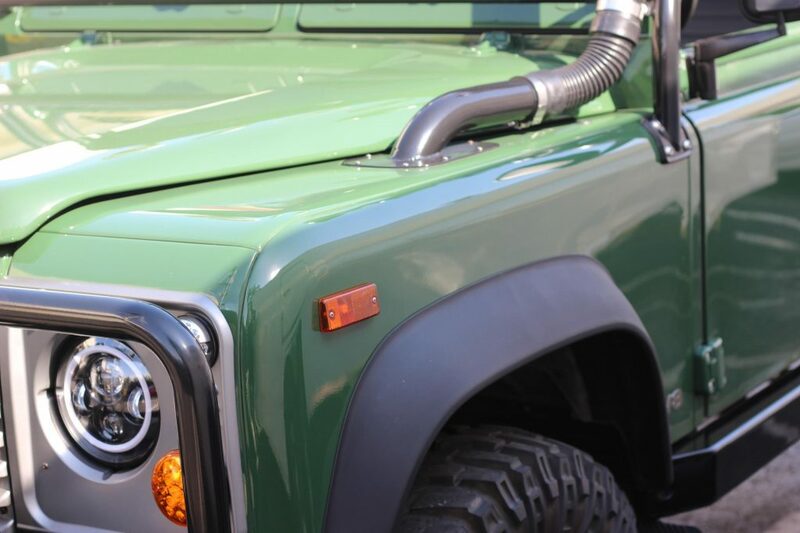 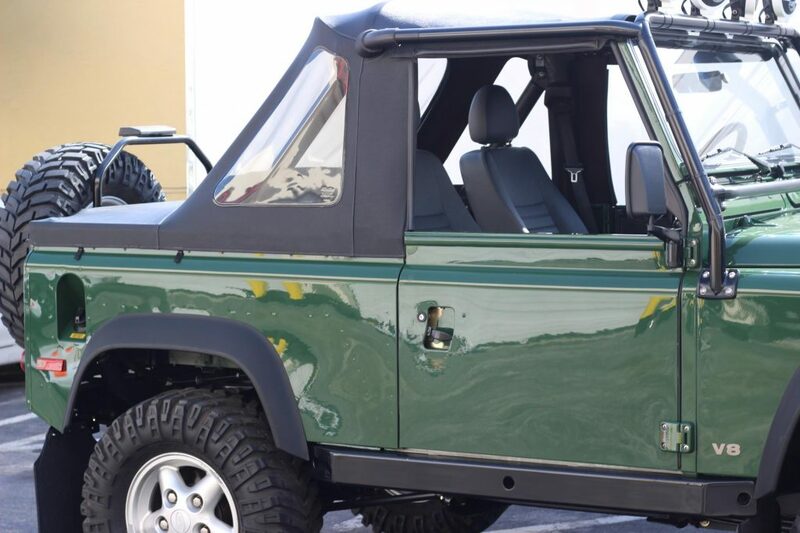 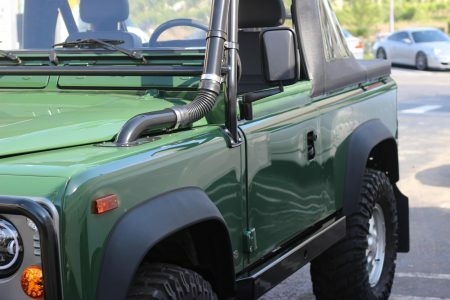 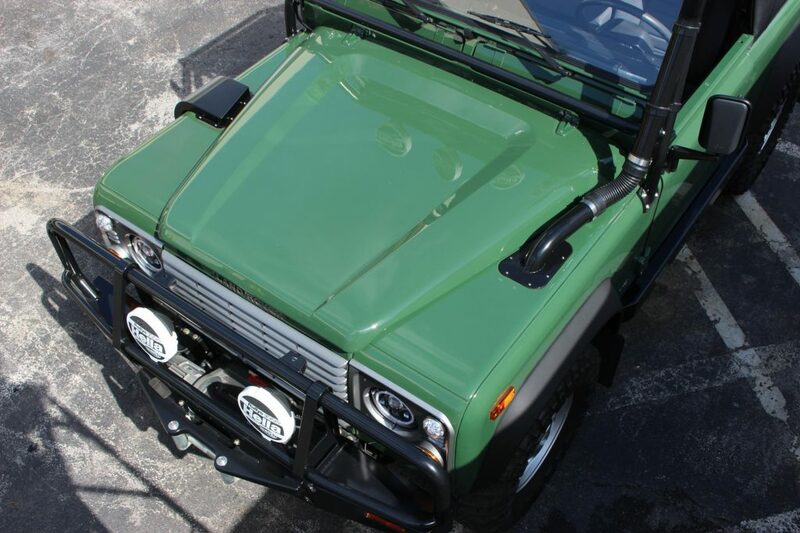 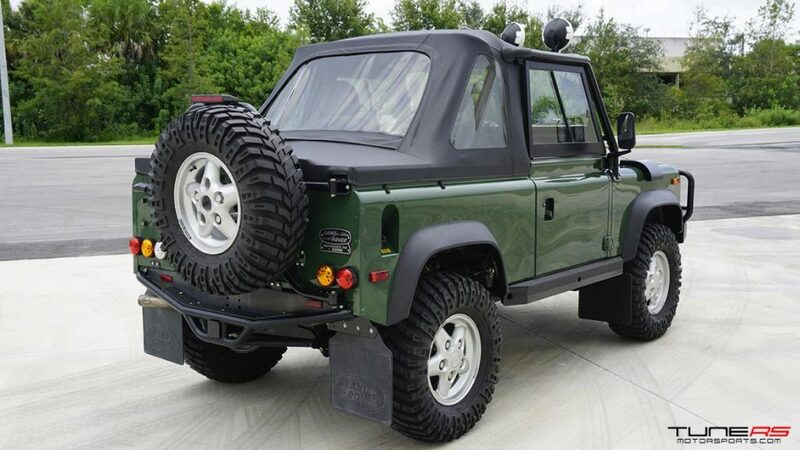 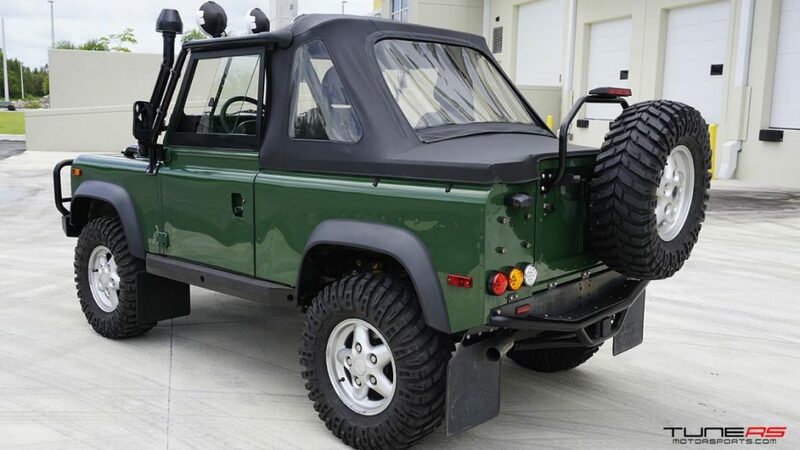 Defender 90 #2170 has most of its original paint in perfect condition, color Coniston green. This color was last available in 1995 and discontinued as an option after that in the later year builds. 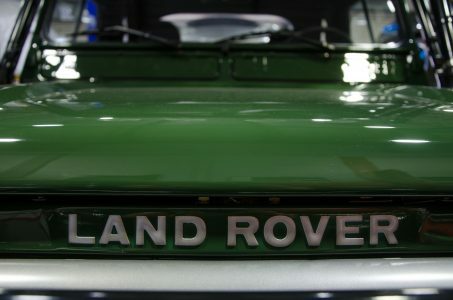 Coniston green represents British heritage. 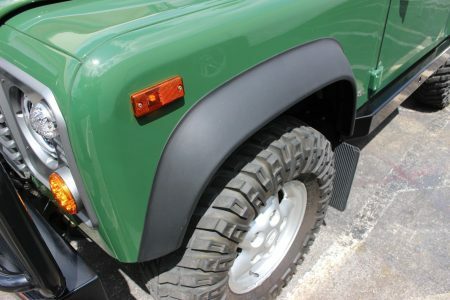 These vehicles were all painted in a single stage urethane as they were meant as true off-road vehicles that would go up against various elements. The body is all original, rust free and no accidents. 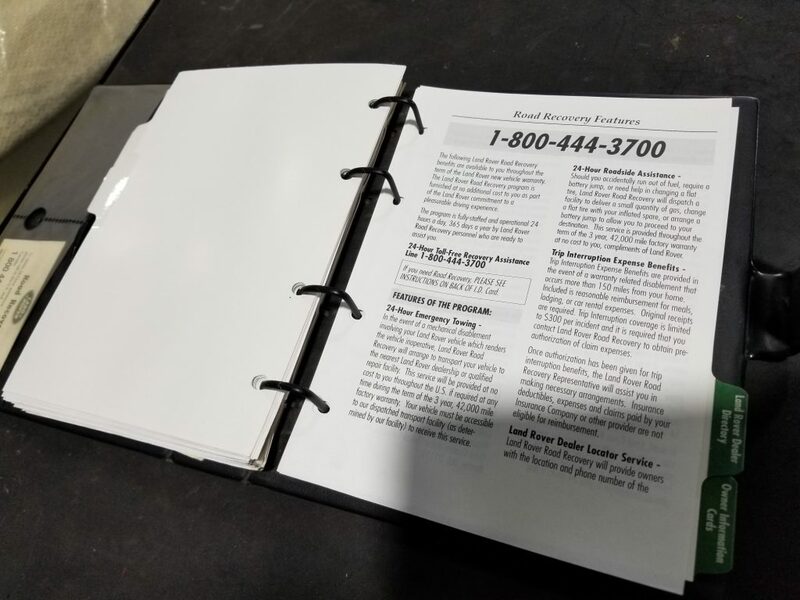 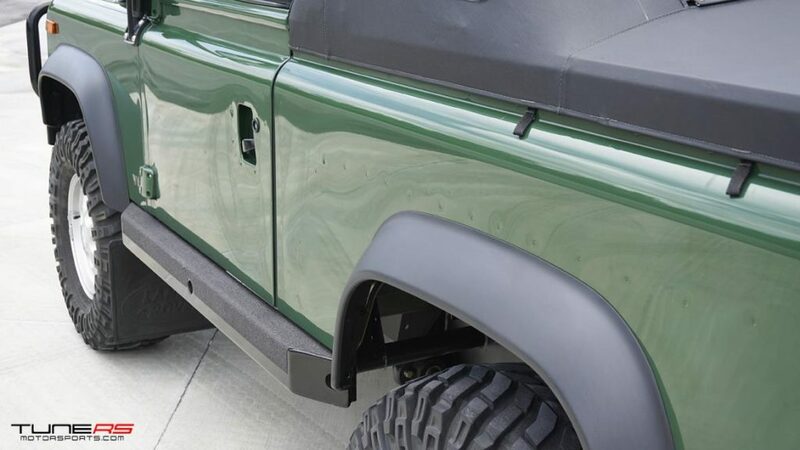 Most Defenders on the market you will find multiple dents and deformations throughout the body, but not on #2170, it’s as straight lined as possible and smooth all around. 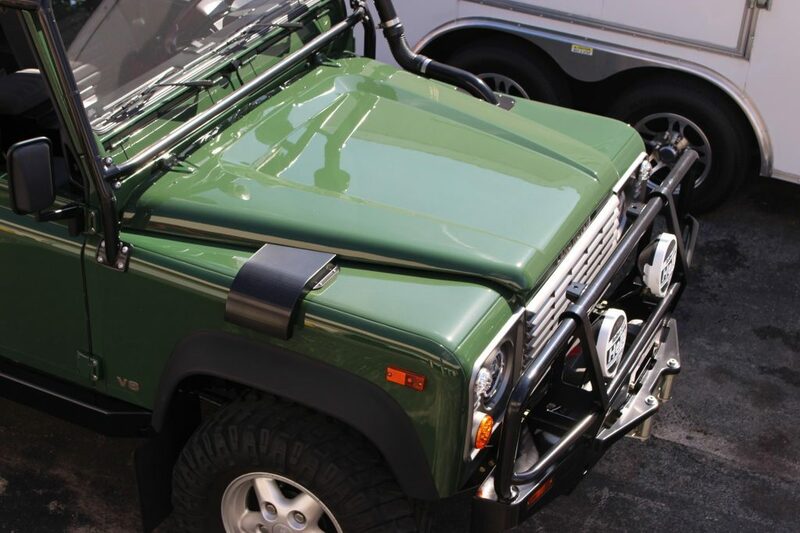 The paint has been perfectly detailed to remove any fine scratches and marks from the last 23 years since production and has been sealed with CeramicPro lifetime ceramic paint protection. A raised air intake snorkel has been installed using original clamps and routing method. 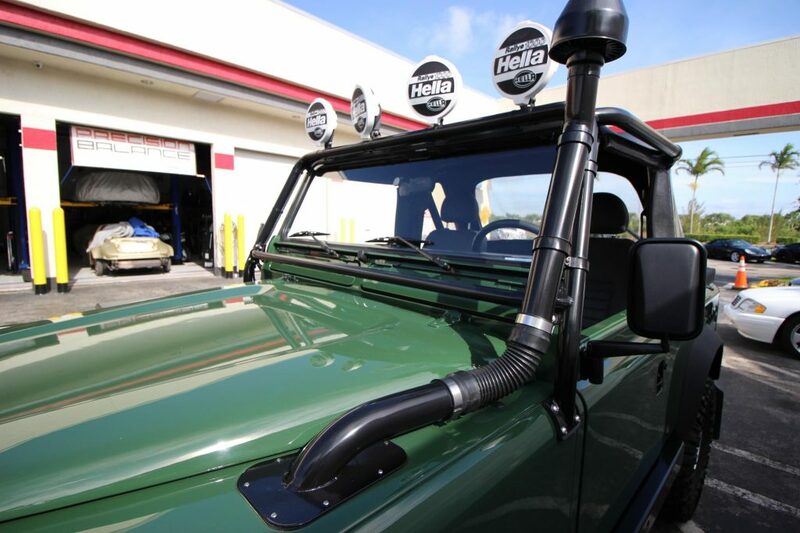 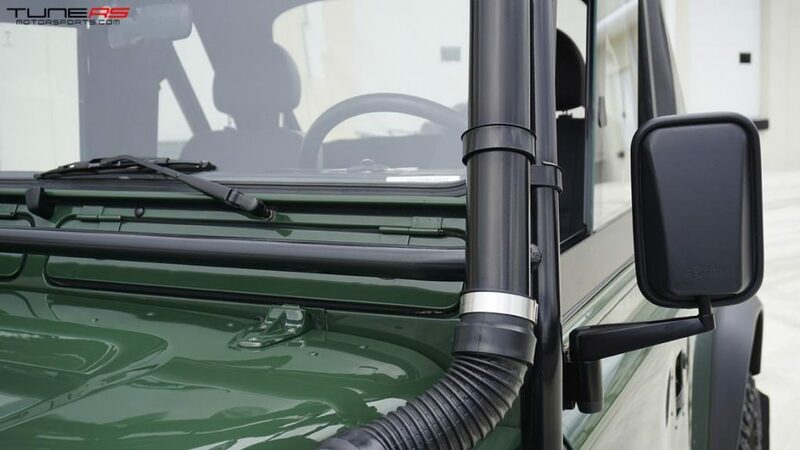 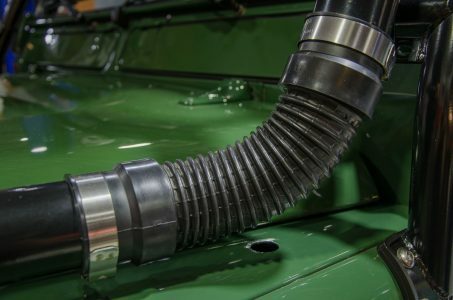 The snorkel provides superior intake filtration to insure clean air delivery to your engine when operating in extremely dusty and deep water conditions. Metal intake tubes are hot dipped galvanized with black powder coat top finish for superior corrosion resistance. 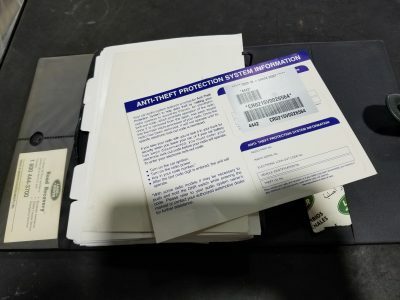 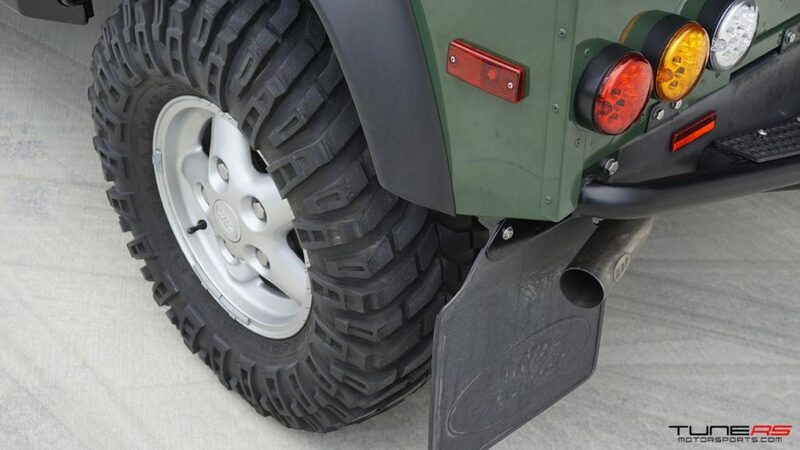 A snow shield has been equipped on the right side fender and this is a must-have accessory for any Defender that may venture up north into colder snowy climates. This protects the heater from ice and snow buildup as well as improves heater performance while driving in rain and snow storms. 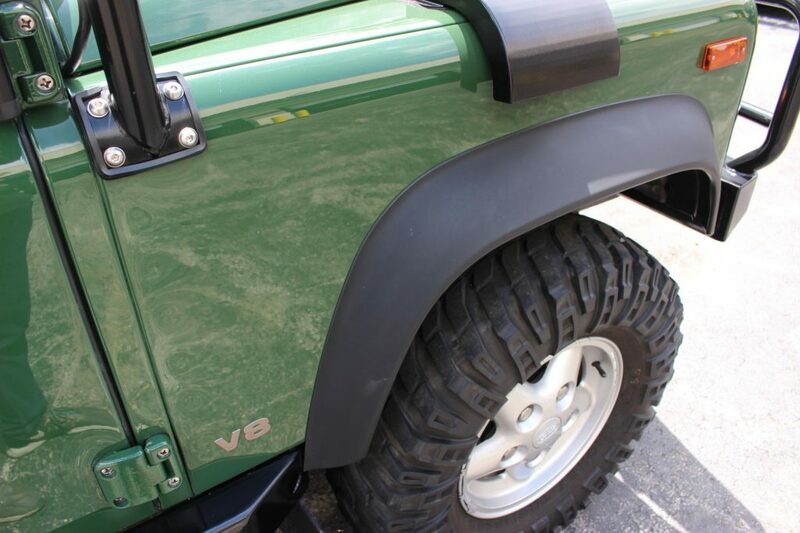 Custom steel rock sliders in black finish compliment the sides of the vehicle while providing a great off-road feature. 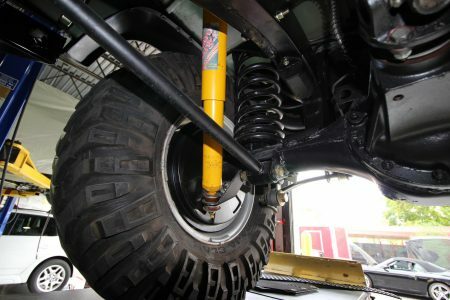 These prevent damage to the bodywork during rock crawling. 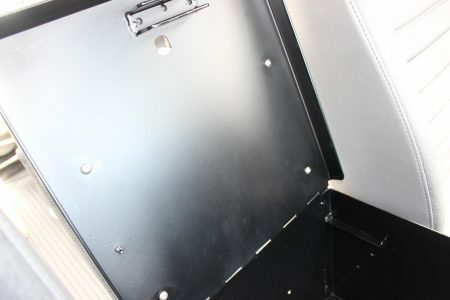 Three holes have been added that allow easier recovery or to have custom steps installed. 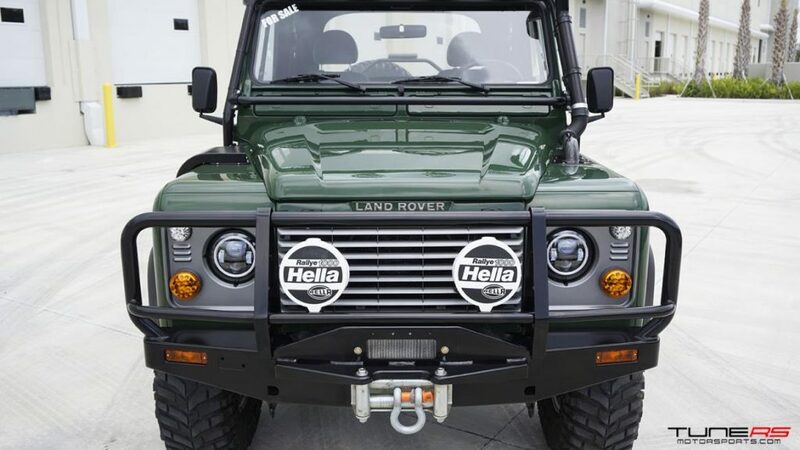 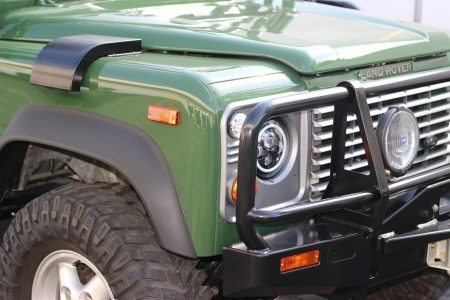 The front bumper is manufactured by ARP and comes with an integrated Warn winch system rated to 9,000lbs. 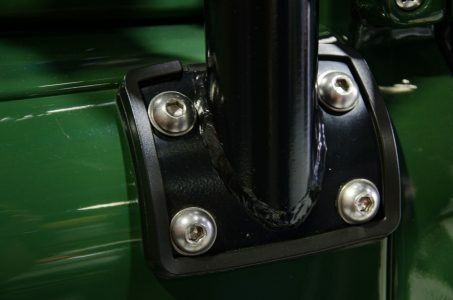 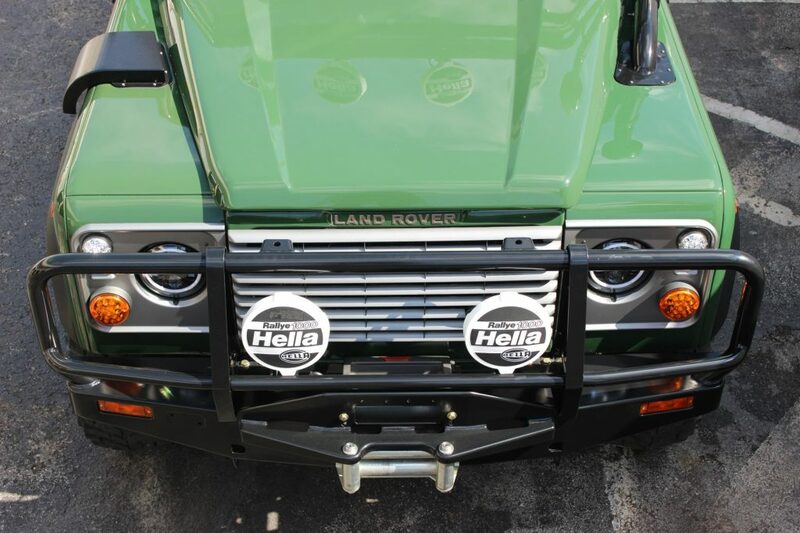 This heavy duty front bumper has integral protection bar and recovery points. 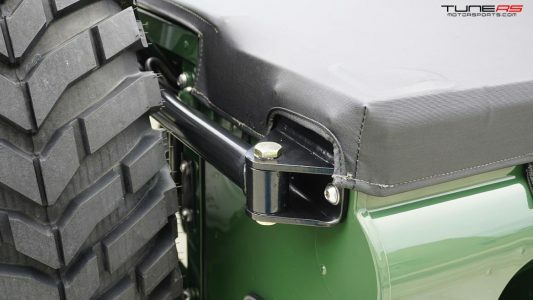 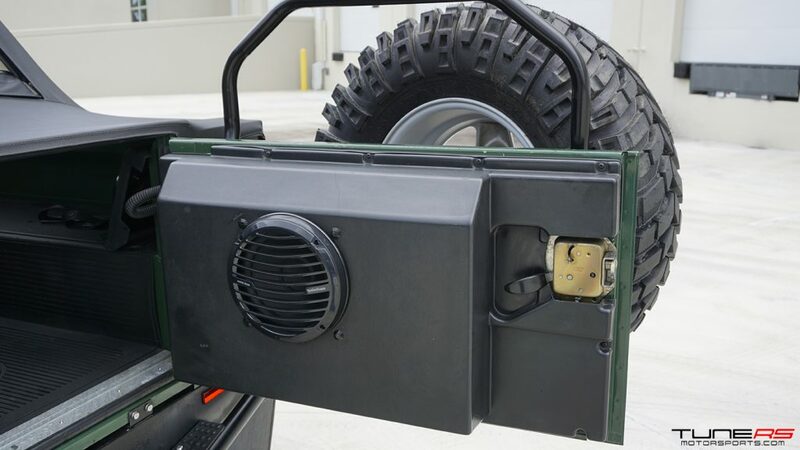 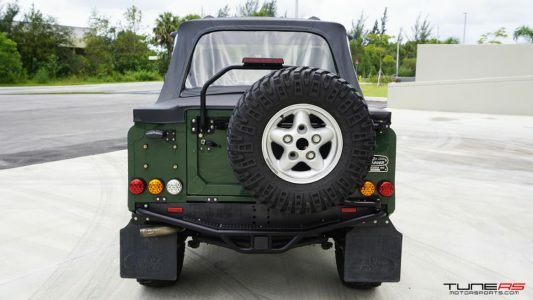 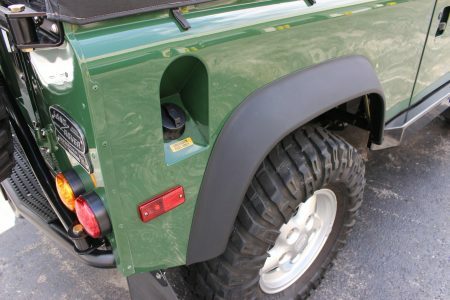 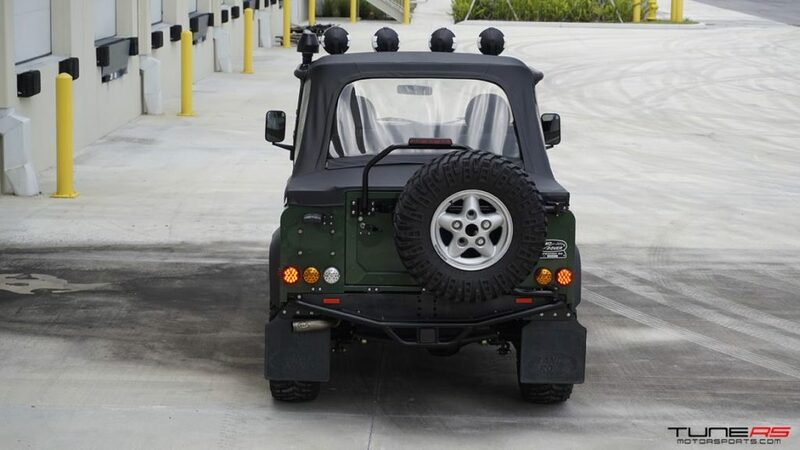 The rear bumper has an integrated step and tow hitch for class 3 receiver with a rubber tread plate. 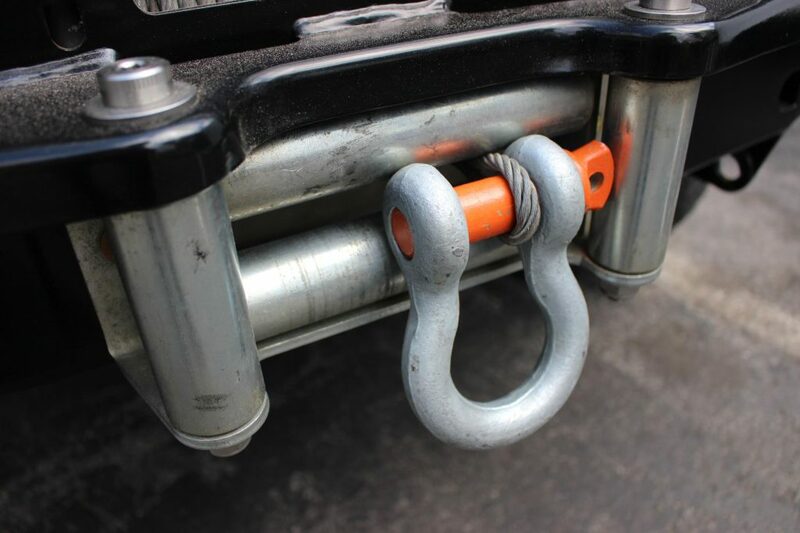 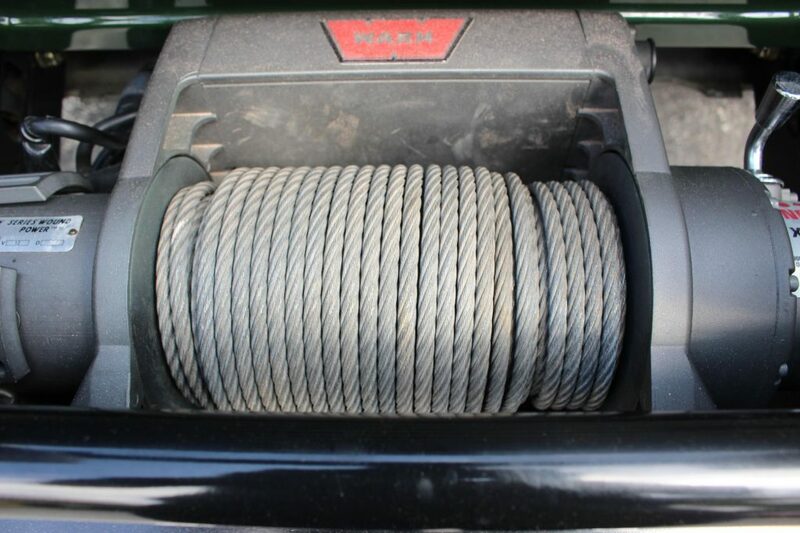 Its tubular construction has a built-in receiver for 2 inch tow hitch and has been hot dipped galvanized and finished with a durable satin black powder coat. 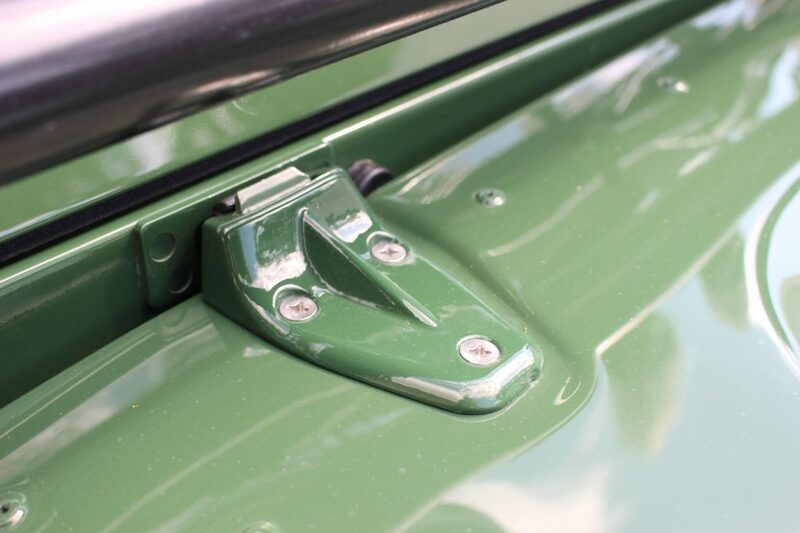 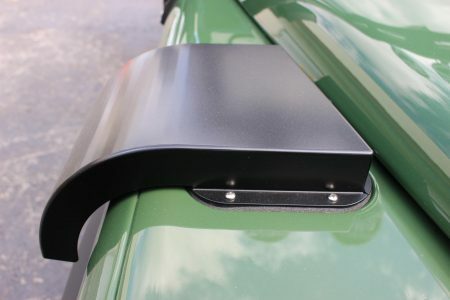 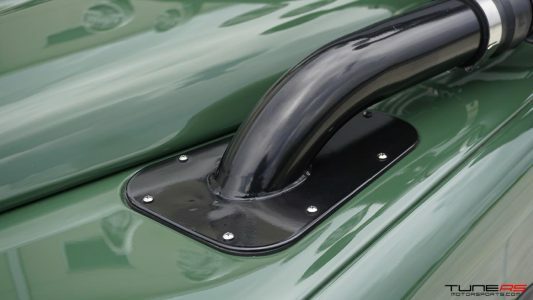 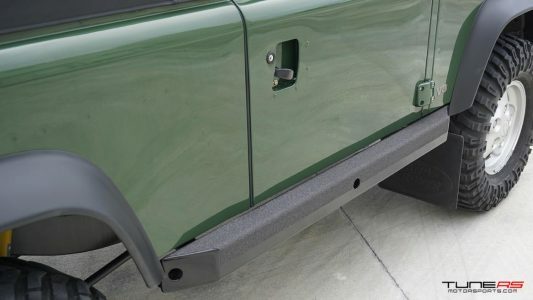 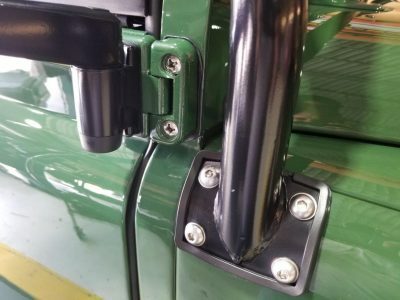 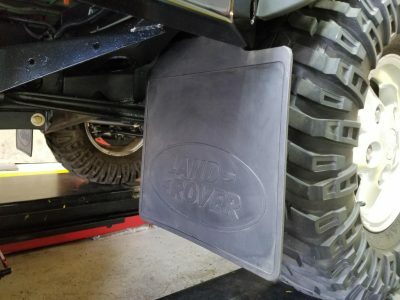 Original Land Rover front and rear mud flaps with custom mounting brackets and stainless hardware help to protect splash back of any rocks, mud, debris onto the side body panels and underbody. All of the exterior lighting has been upgraded and updated to LED lights. 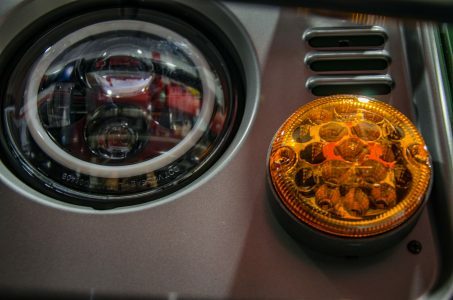 LED has a lower consumption and much better illumination at night. 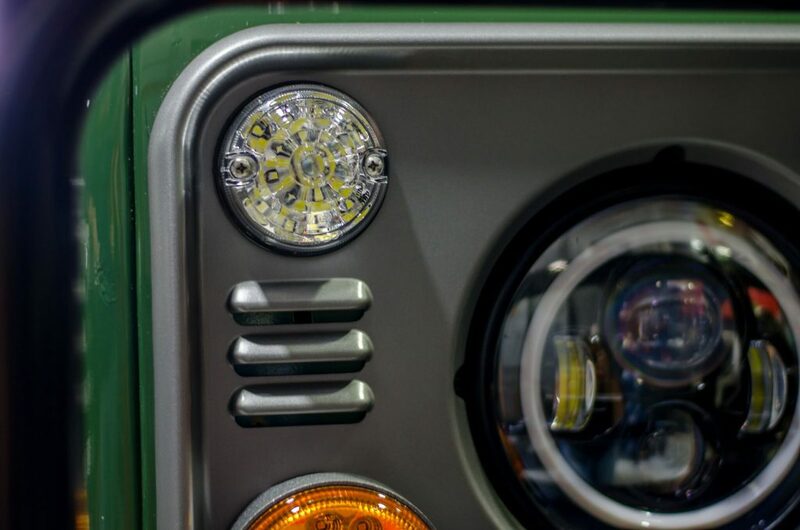 The front headlights are custom LED with integrated turn signals that provide a much more visibility when driving at night. 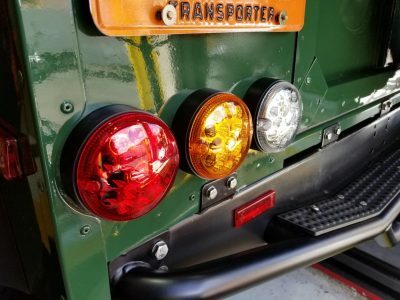 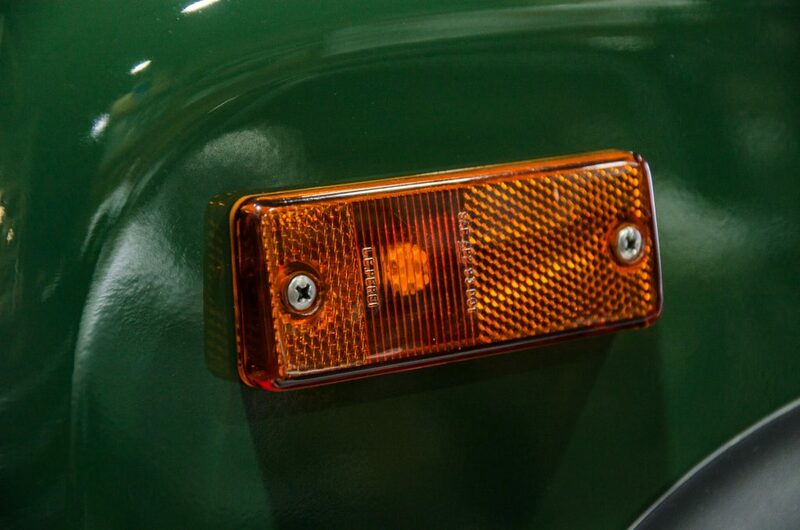 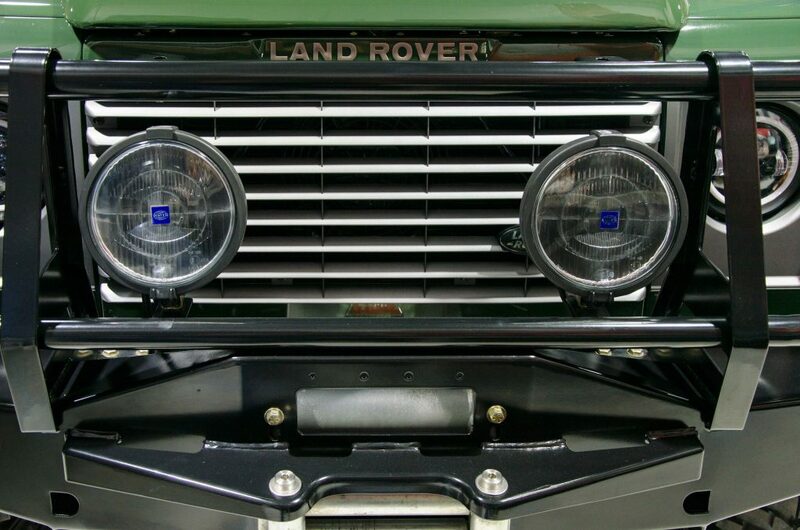 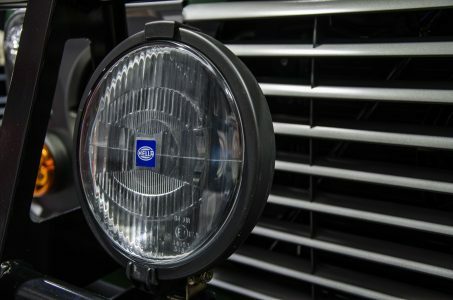 The front marker lamps have original housings but now have LED bulbs. The rear tail lights have all been replaced with LED’s but maintaining the original round housing design. 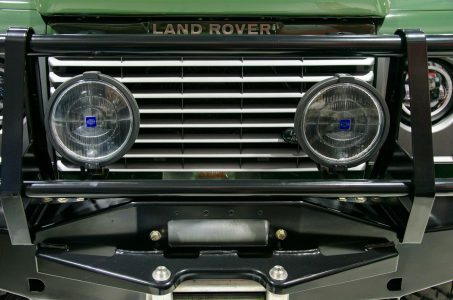 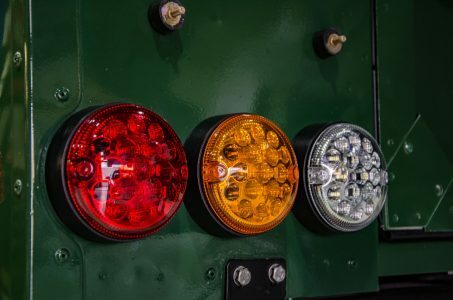 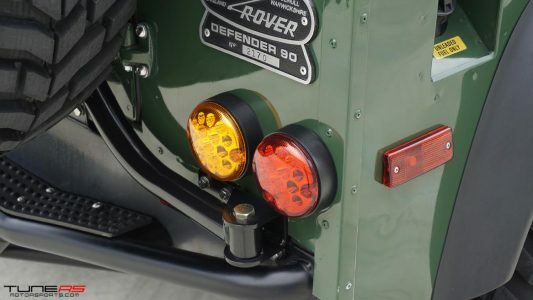 Only 1995 model year Defender 90’s were equipped with round style lights in front and rear and is an easy way of telling model years apart. 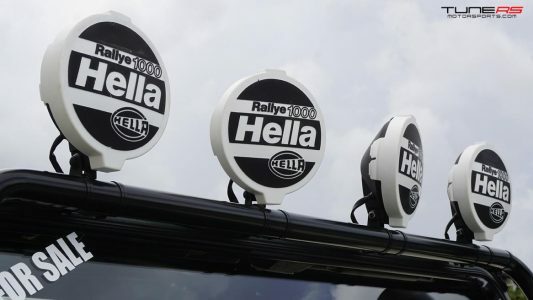 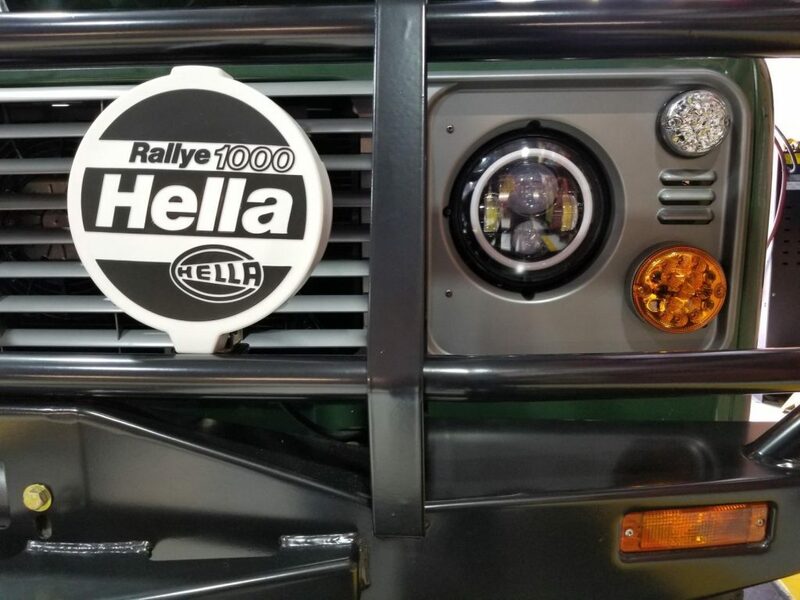 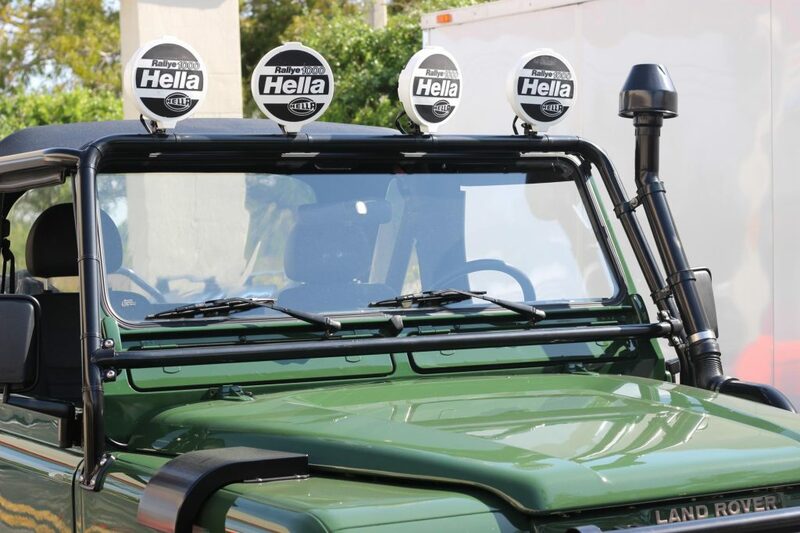 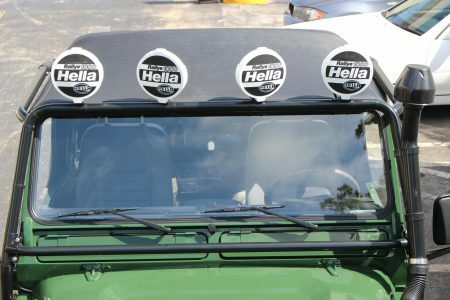 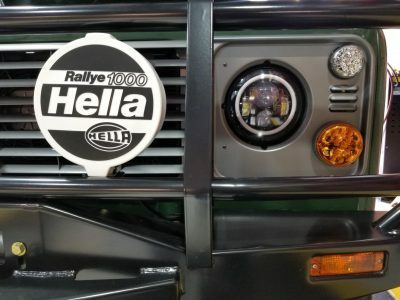 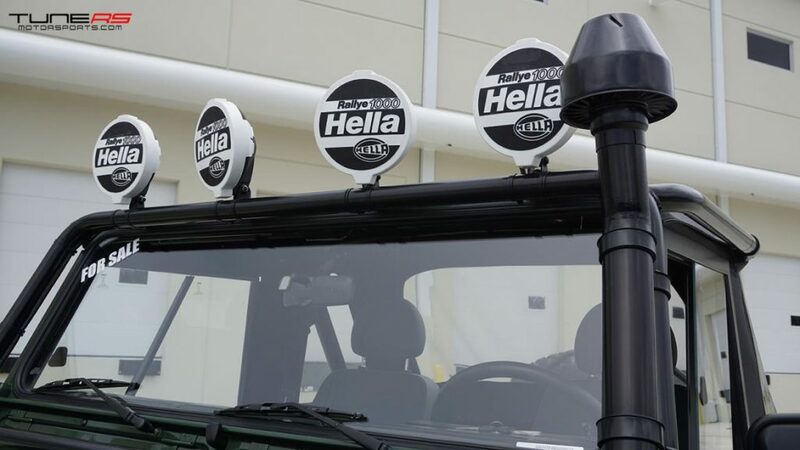 A set of six Hella Rallye 1000 off-road lights, all brand new, have been installed with a custom three switch panel on the interior. 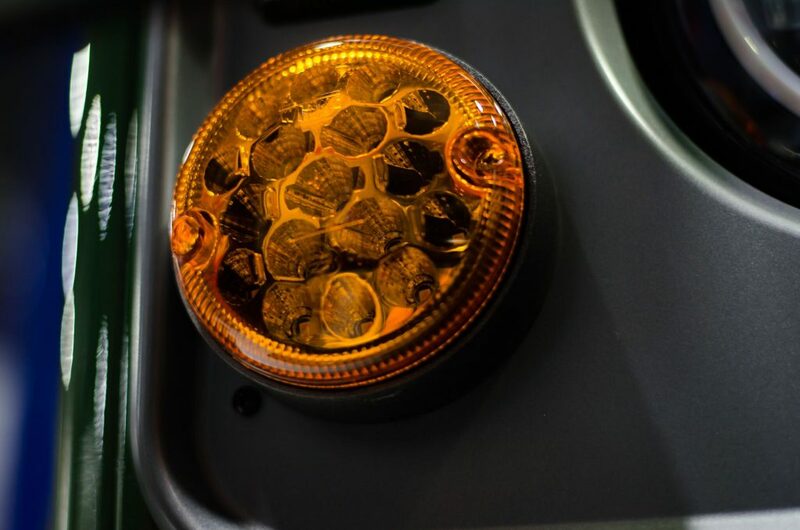 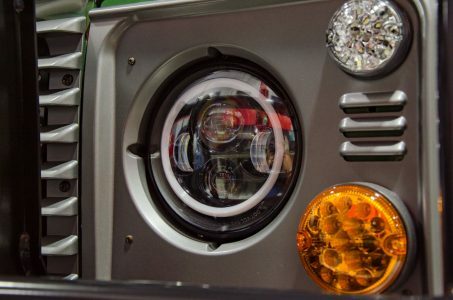 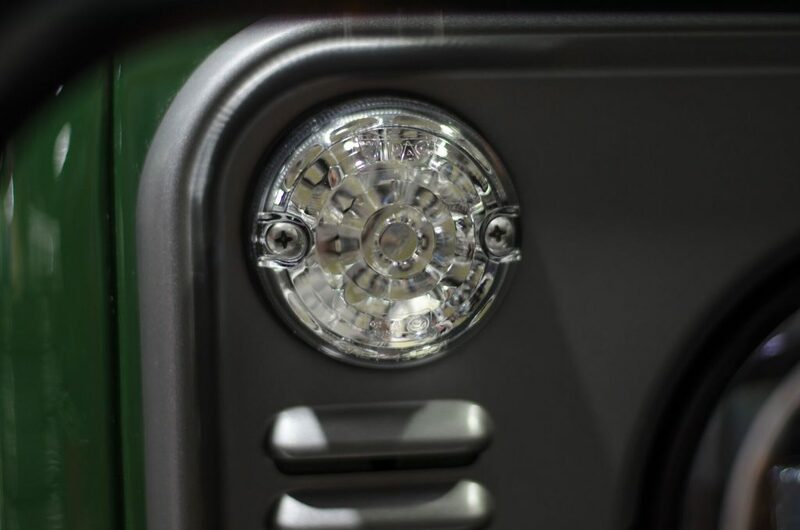 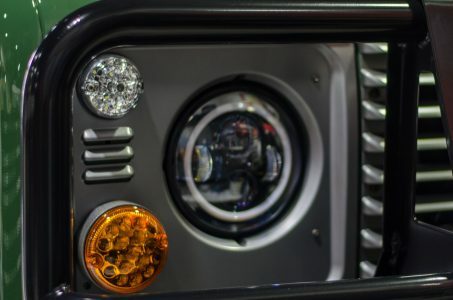 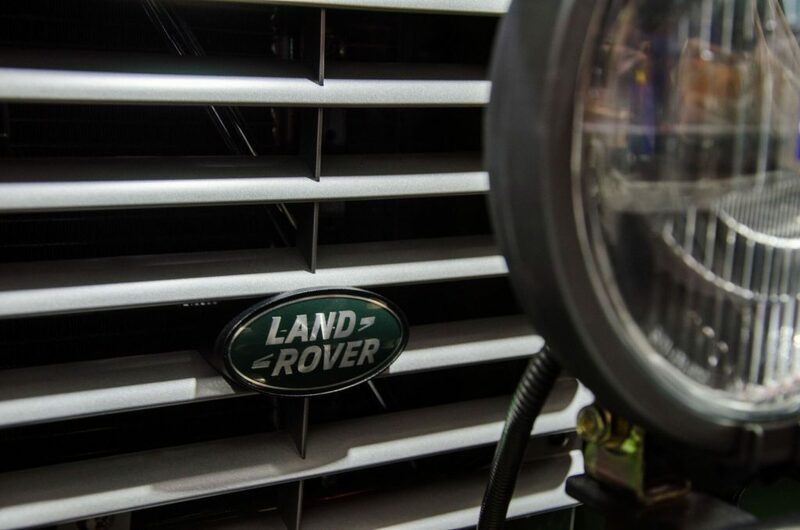 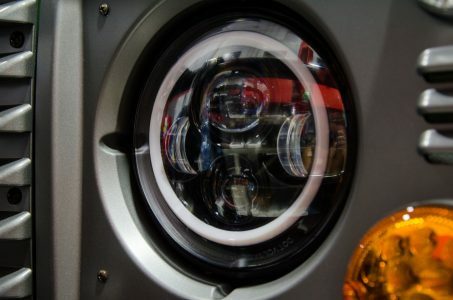 These lights illuminate everything at night and are a must for any off-road vehicle. 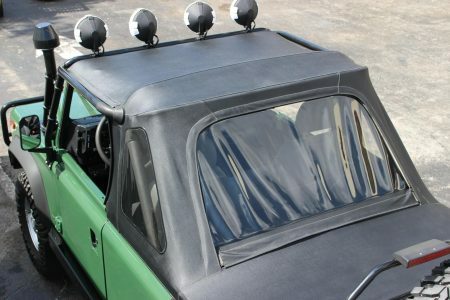 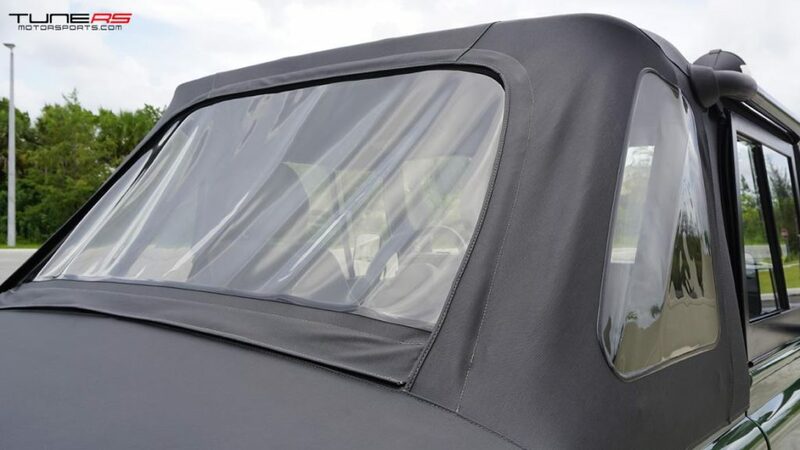 The canvas top is the original Fastback top that was manufactured by Bestop in 1995. 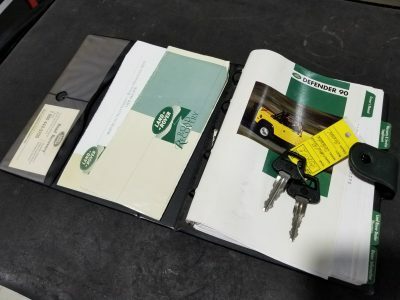 It has the date stamp 03 1995 indicating the original top for this model. 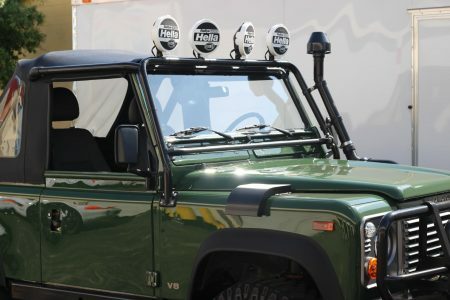 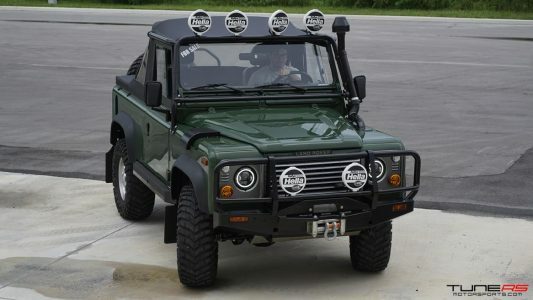 The canvas by Bestop was only available on the 1995 Defenders as the previous 1994 model had issues with the prior manufacturer. 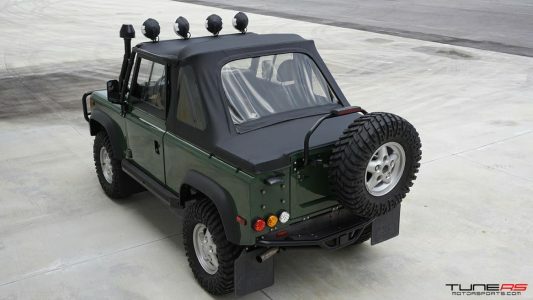 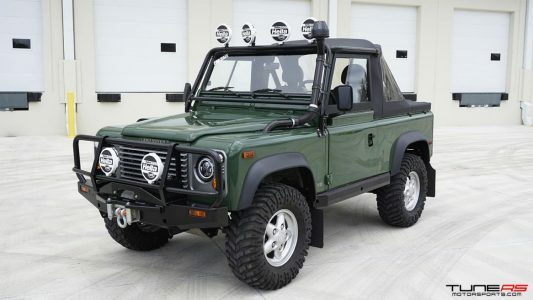 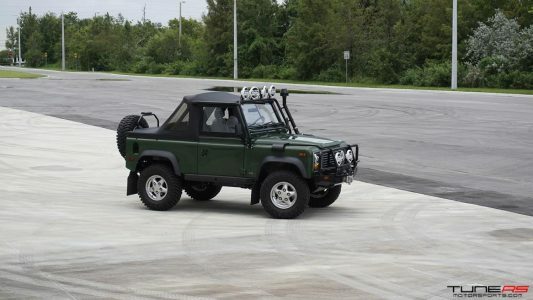 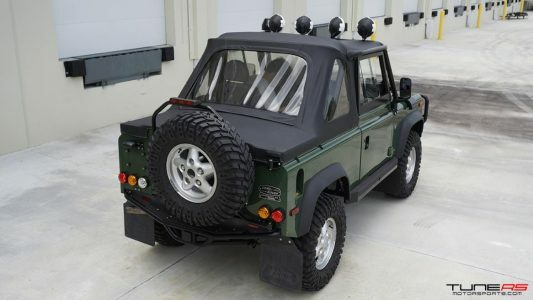 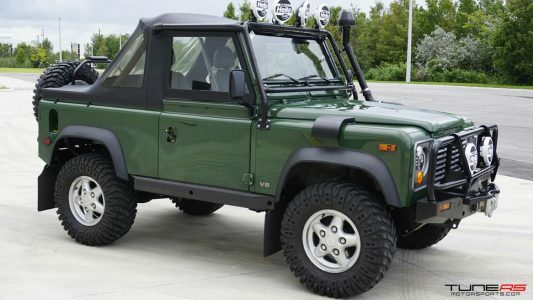 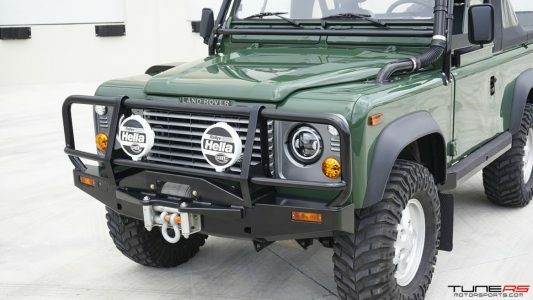 This is now one of the rarest options for a Defender 90 as not many fastback canvas options were ordered at the time. The rear spare tire support bar has been modified and improved over the factory setup. 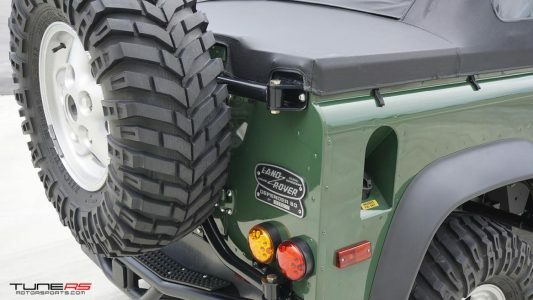 The original setup was very weak and carrying a heavy spare tire they tended to crack overtime. 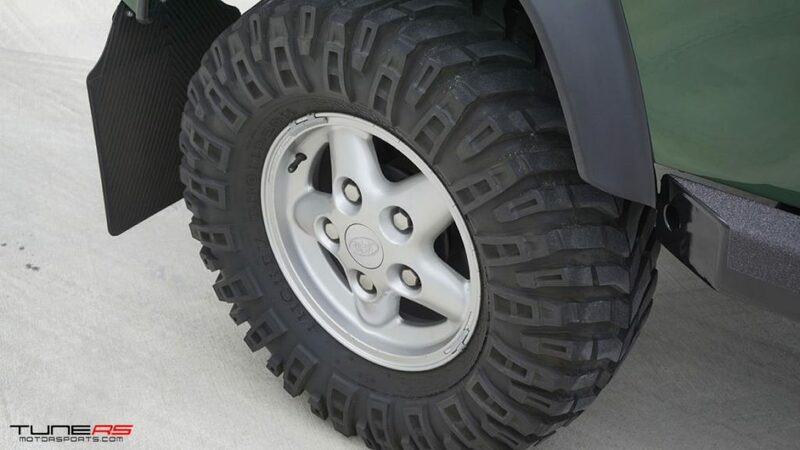 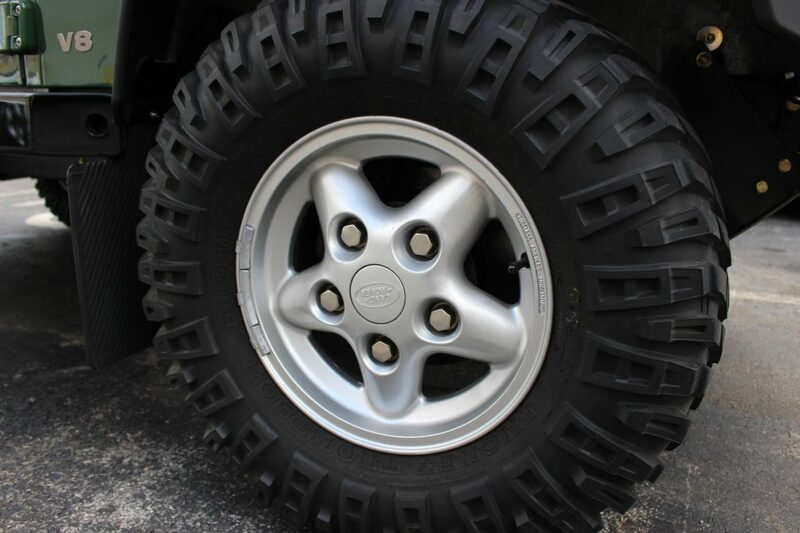 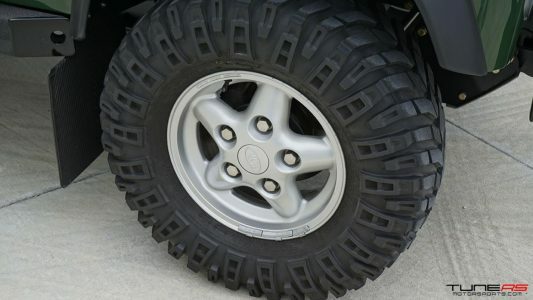 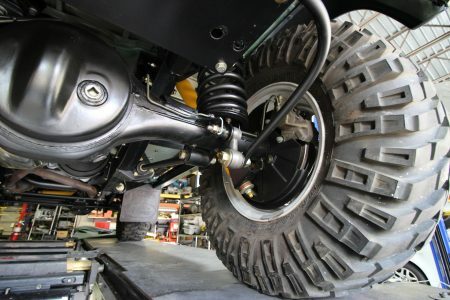 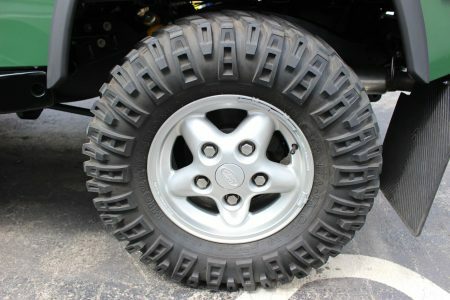 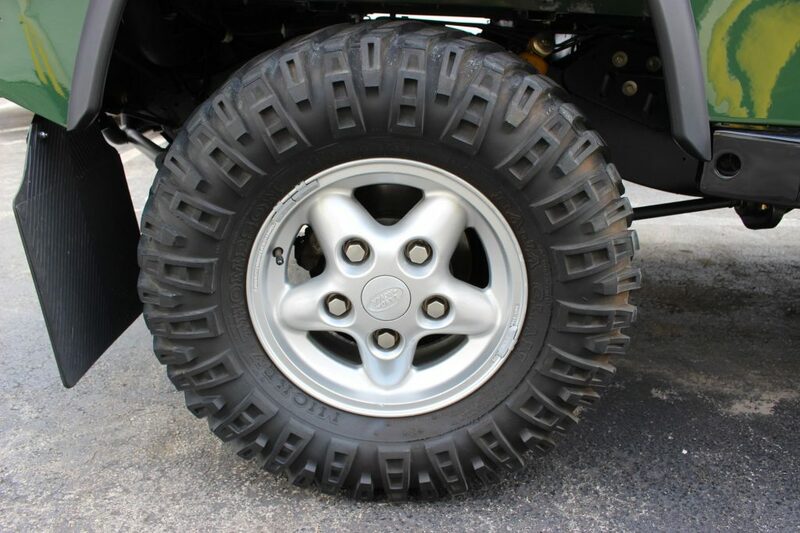 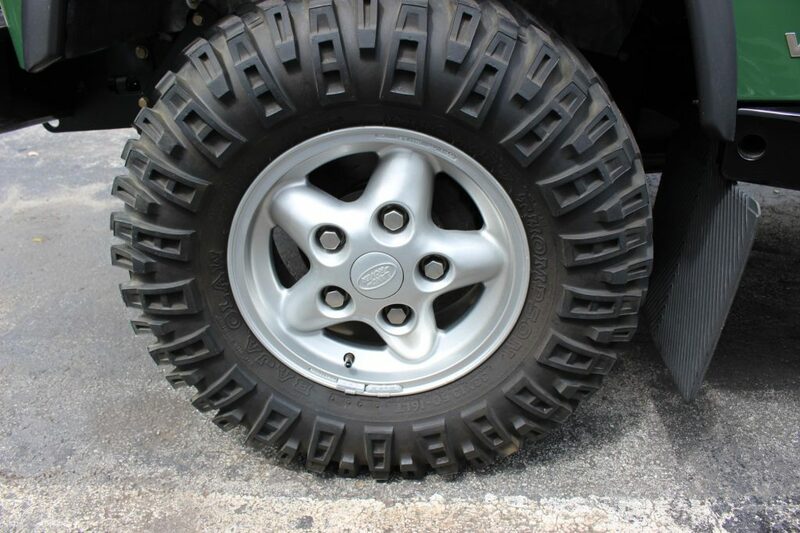 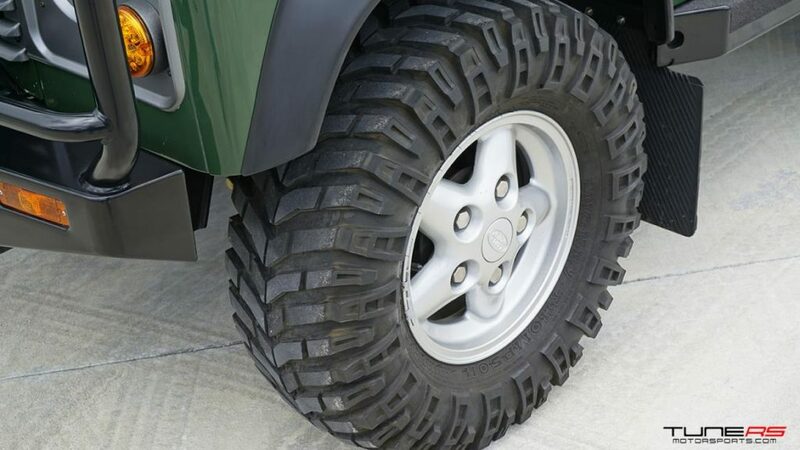 Not only that, but having an off-road setup tire such as this model the spare would rub against the body creating unnecessary scratches and marks. 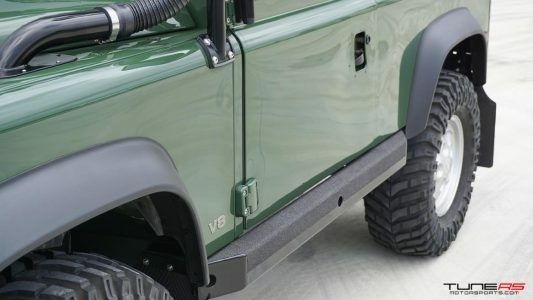 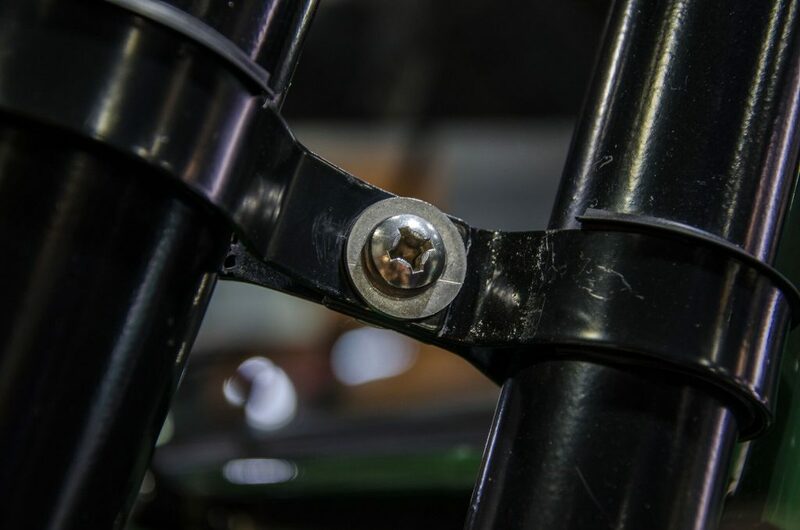 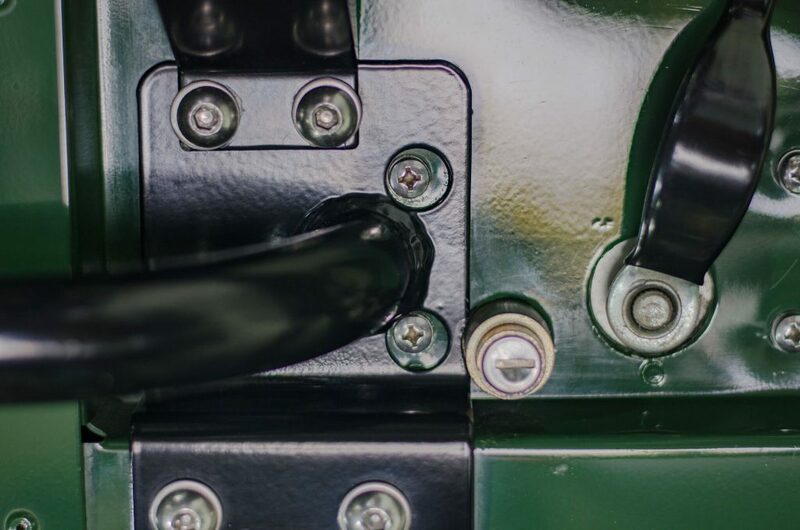 The custom made support bars set the tire half an inch further out than the original style, providing enough clearance between tire and body on the rear. 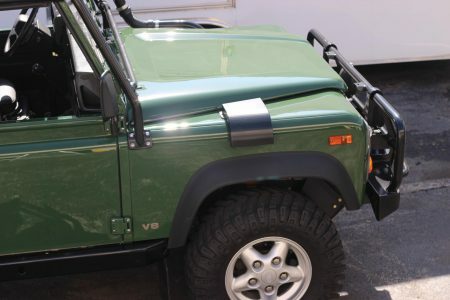 The front door hinges were another weak point on these vehicles and some tended to rust and crack in this area. 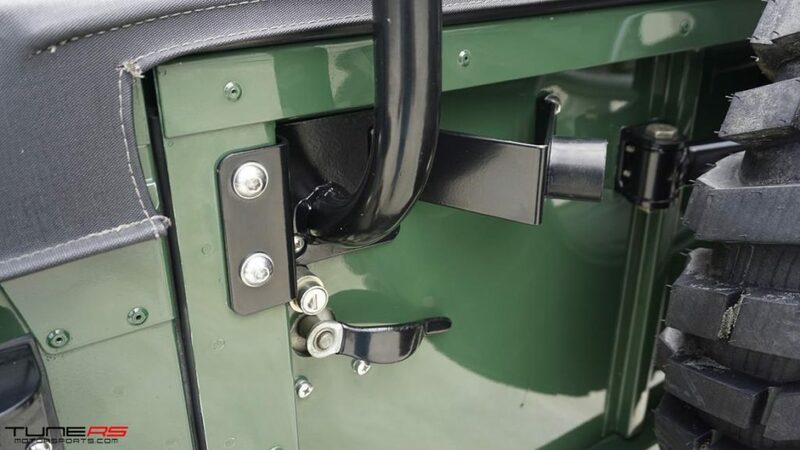 This Defender has all new door hinges, upgraded with galvanized versions for corrosion protection. They have been painted to match the Coniston green color and have been improved with stainless hardware for extra corrosion protection. 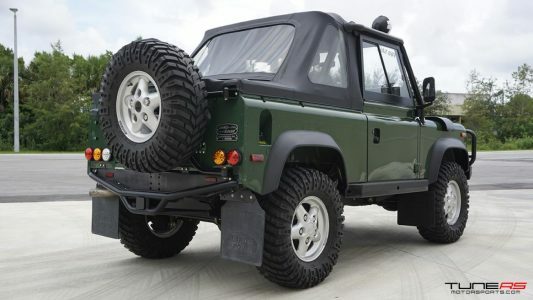 Most of the Defender’s produced were susceptible to rust problems on the undercarriage. 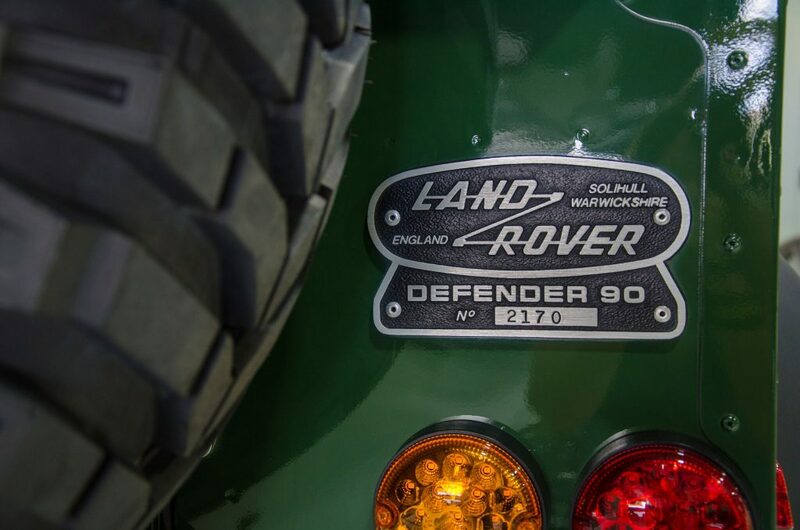 This Defender 90 however is one of the few that has a rust-free all original frame. 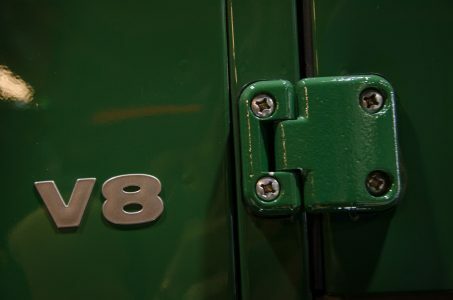 The frame has the VIN number stamped as well as production code indicating originality. 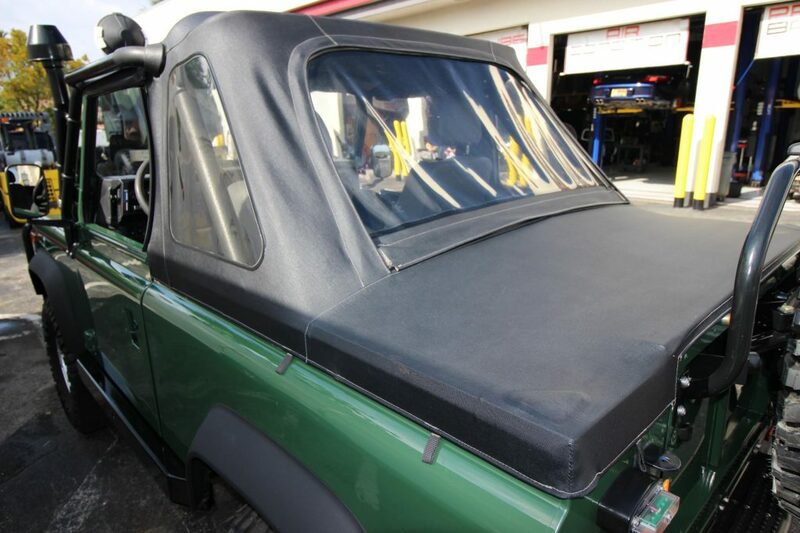 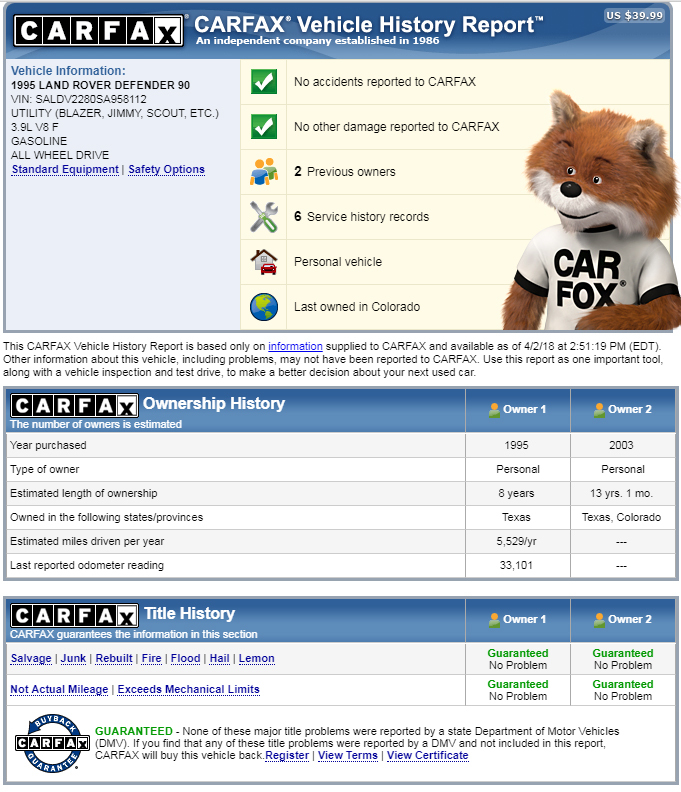 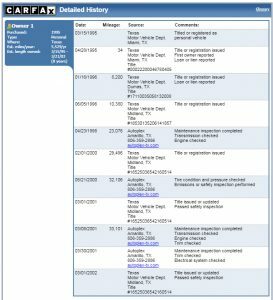 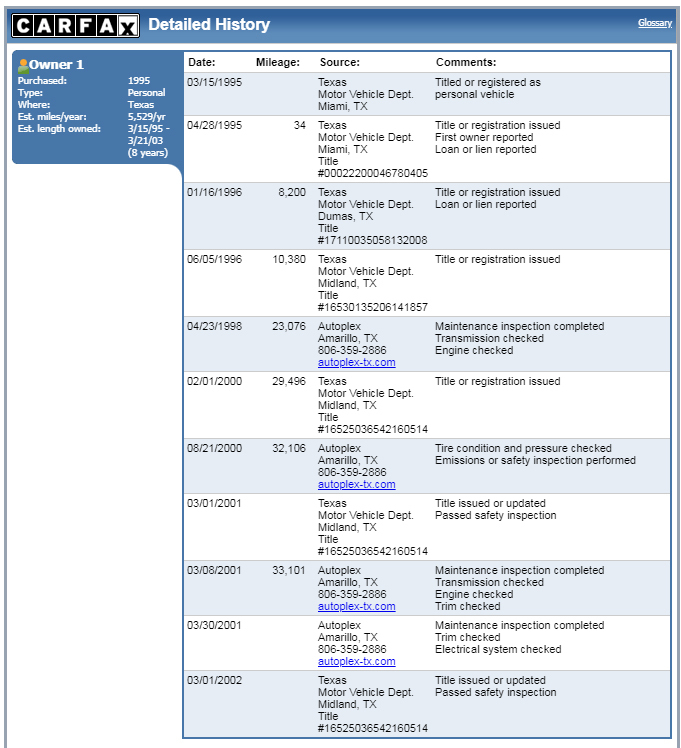 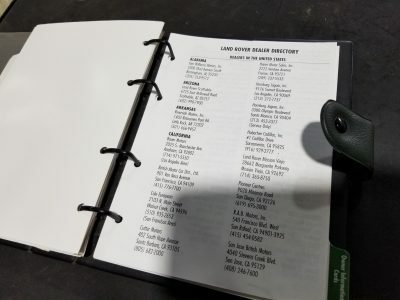 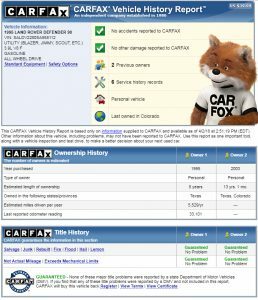 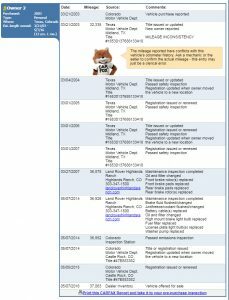 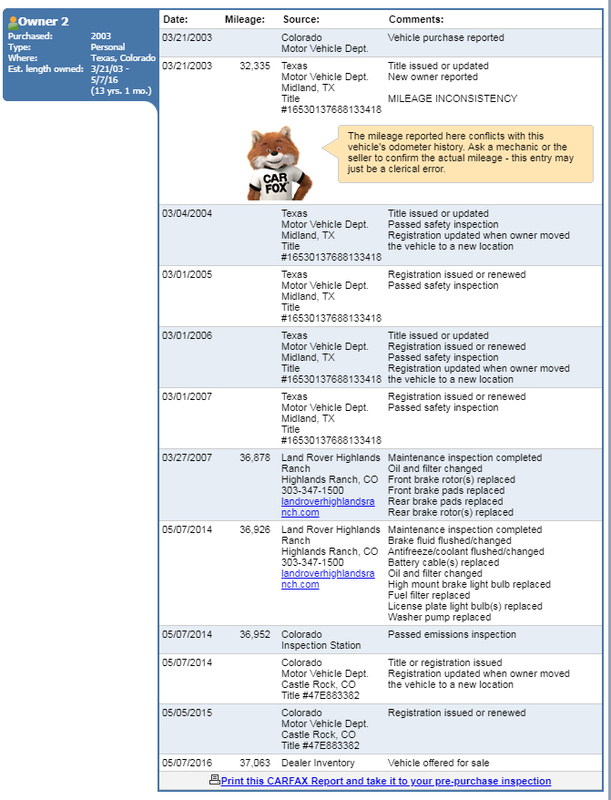 No accidents or repairs have been found after a very thorough inspection. 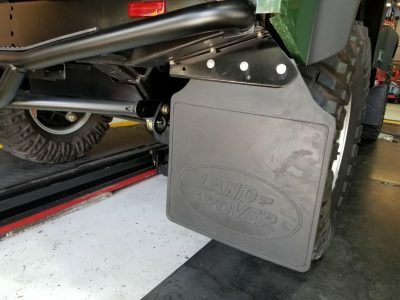 The entire undercarriage was first cleaned with dry ice (CryoDetail) to remove all years of contaminants, dirt, debris and anything else that may have stuck over the years. 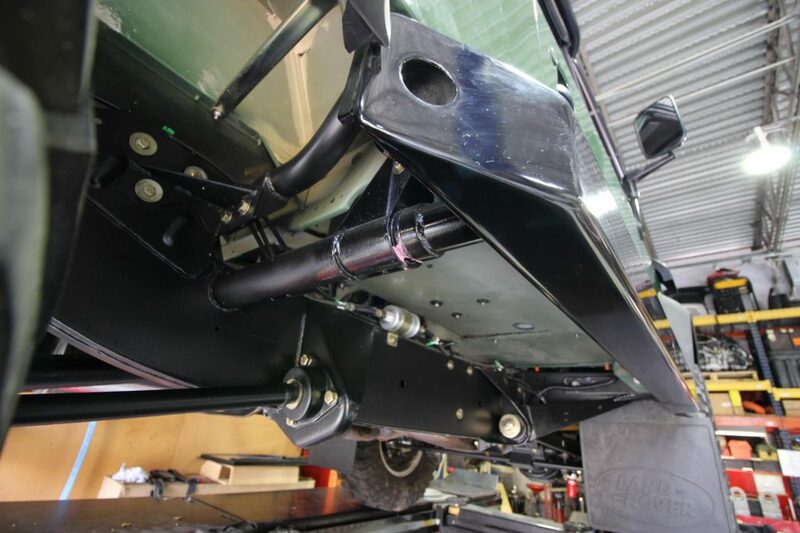 This provides a beautiful refreshed undercarriage as well as a good working environment for any restoration or preservation facility. 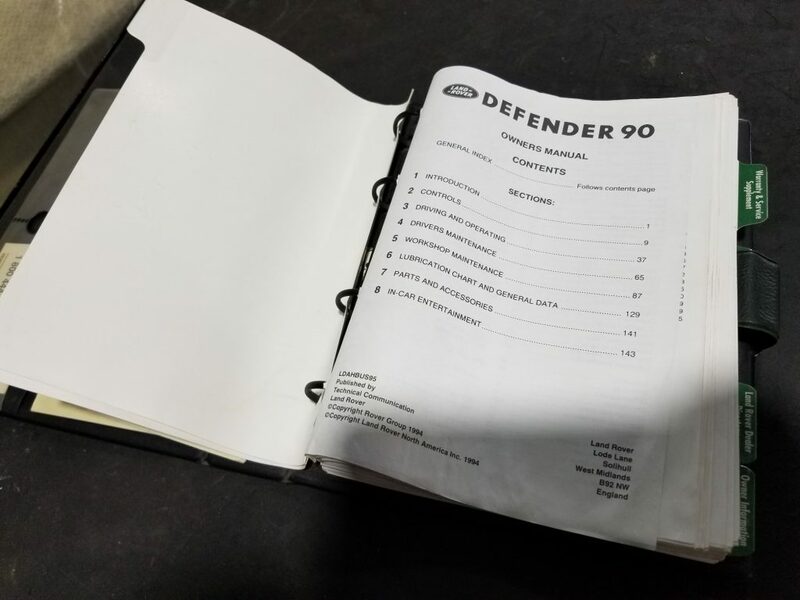 By removing all of the debris, we were able to get a glimpse of how well maintained and preserved this Defender 90 was. The hardware is all original, re-plated and heat treated. 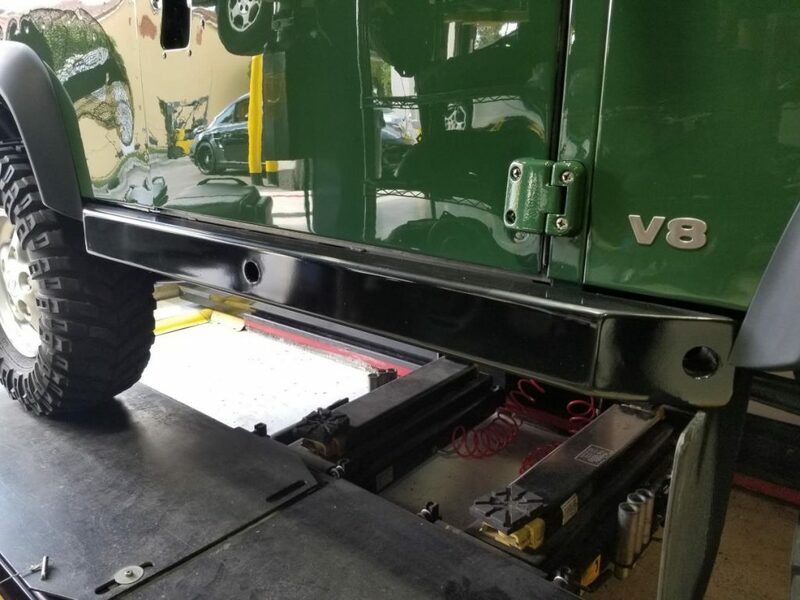 The frame was cleaned completely, sanded down in areas that were rough and had a coat of rust-preventative satin black paint and a 2k urethane satin clear for ultimate appearance and protection. 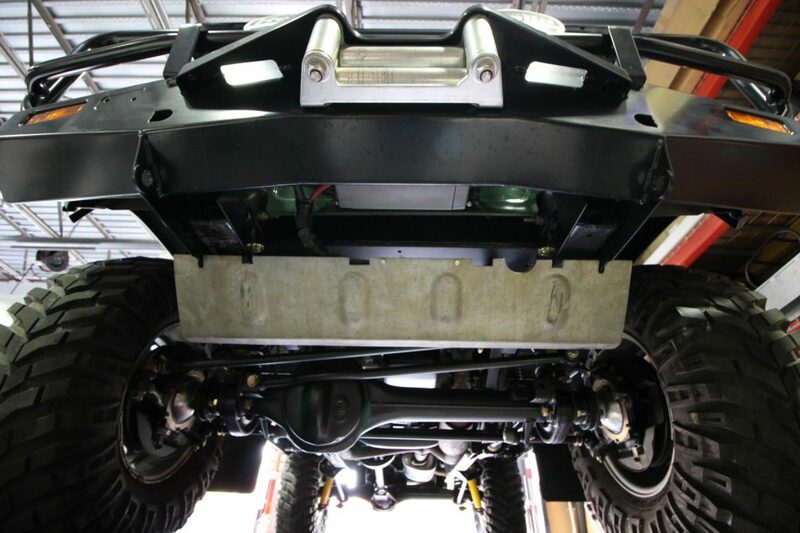 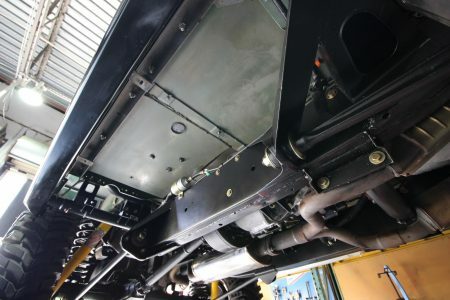 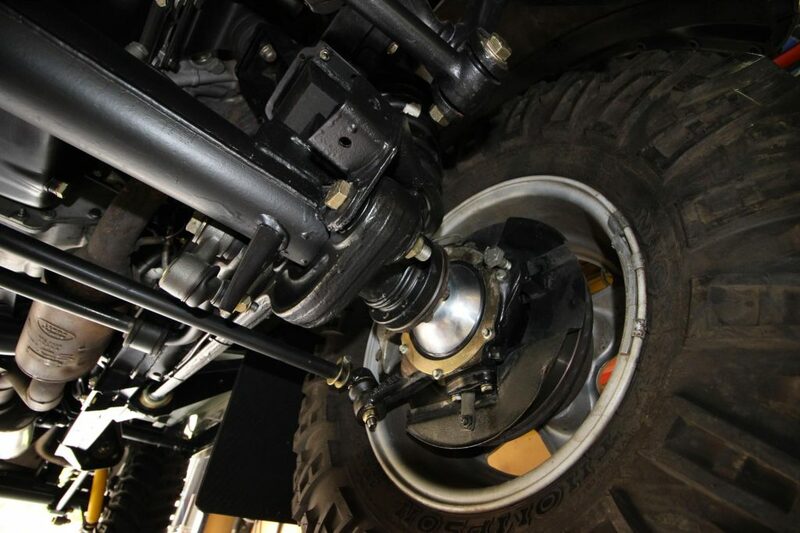 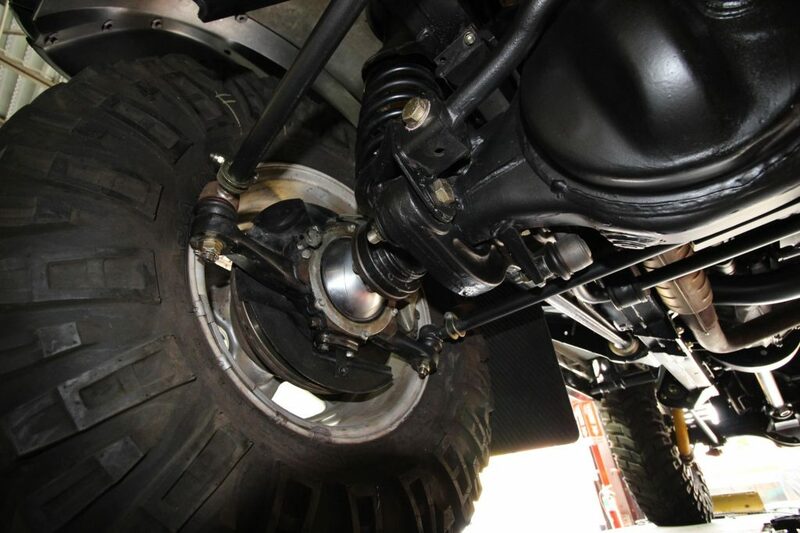 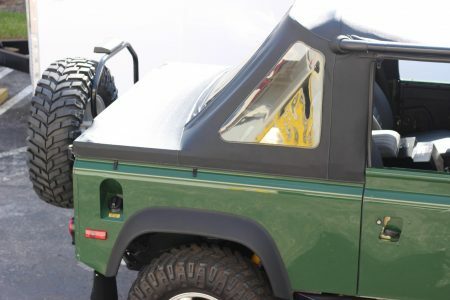 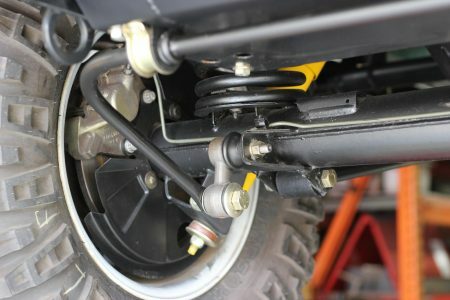 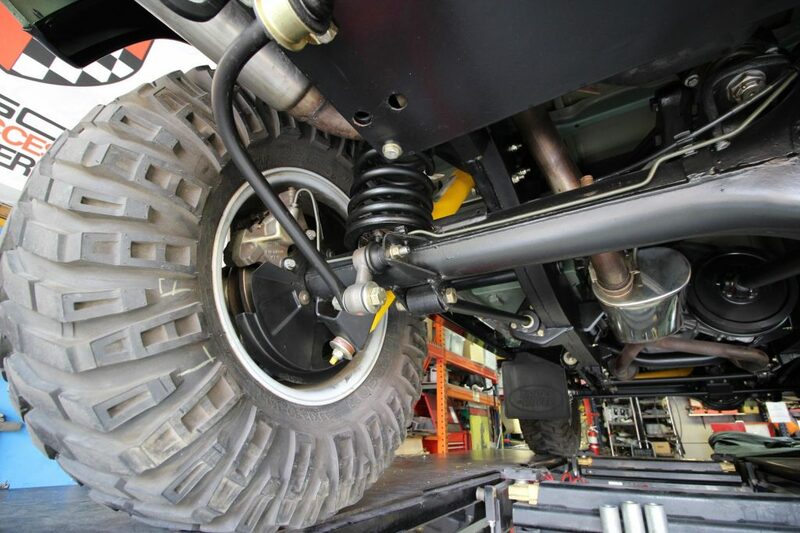 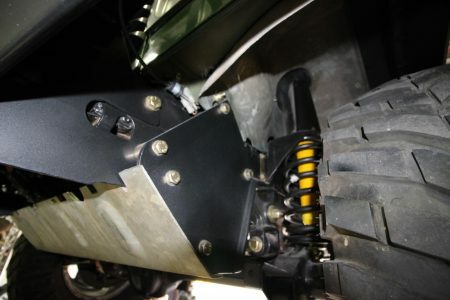 The undercarriage of this Defender 90 sets it apart from all others on the market. 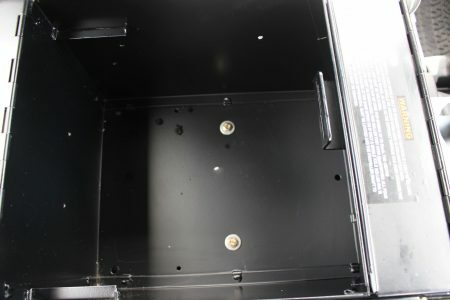 Not a single nut, bolt, washer or component was left untouched. 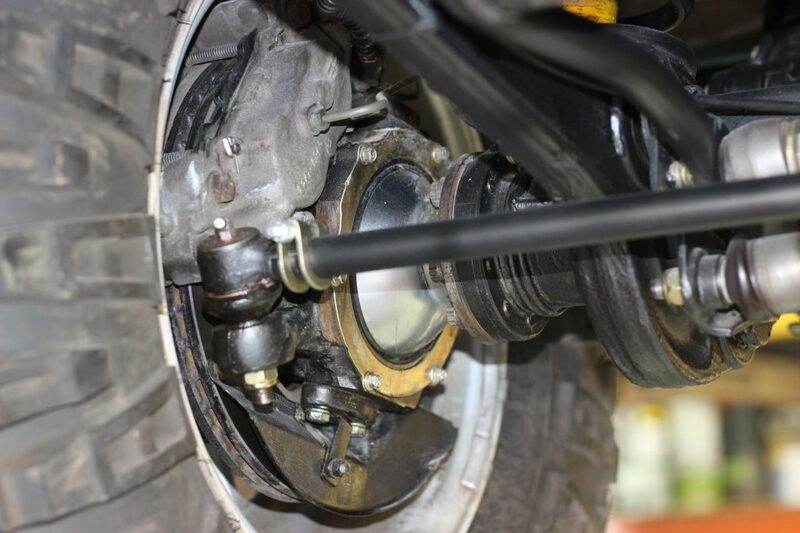 All suspension components were removed, cleaned, refreshed or replaced. 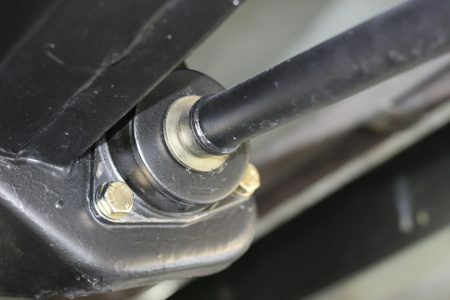 Bushings are brand new and a 2” Old Man Emu lift kit with nitro-charged shocks are installed. 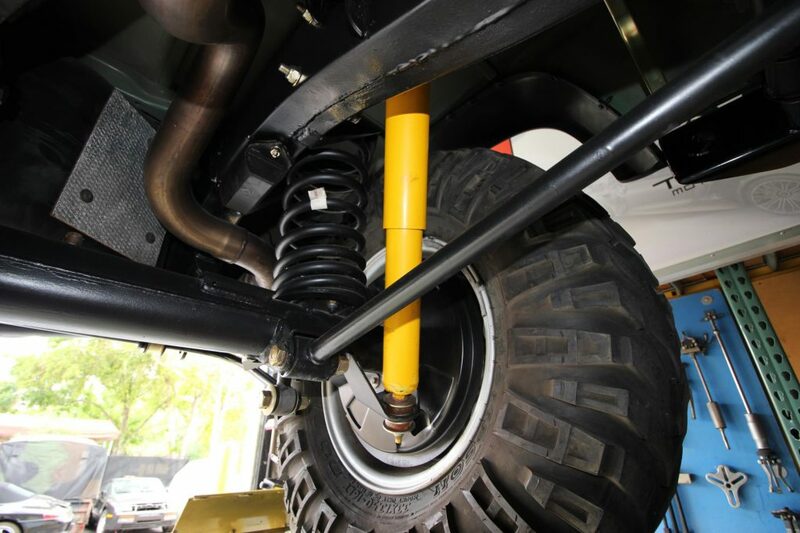 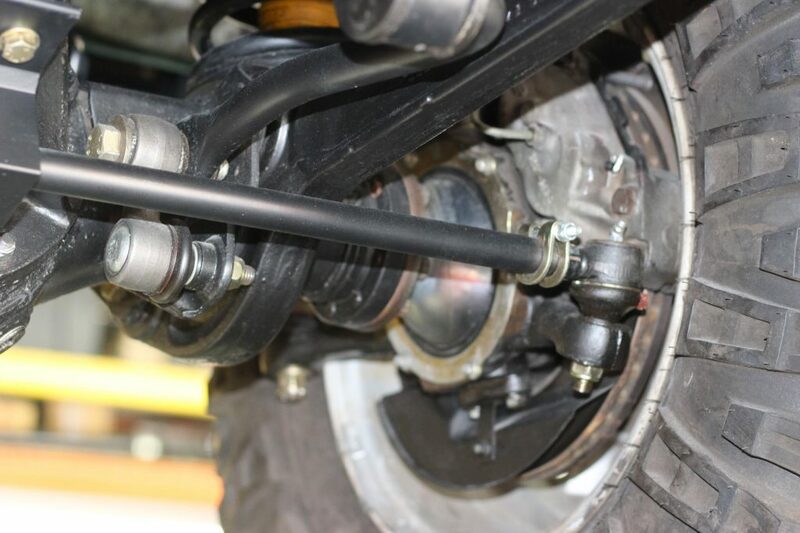 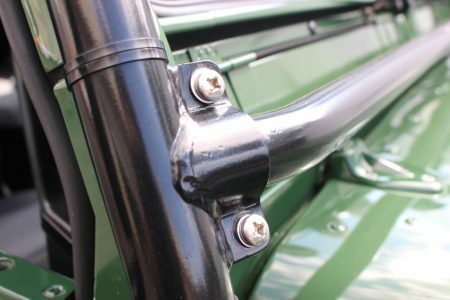 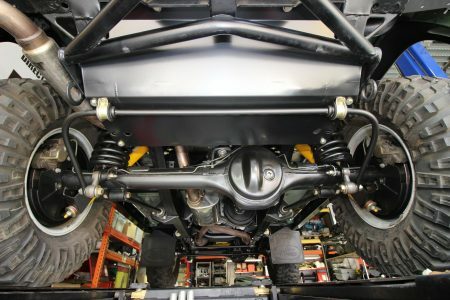 The option of sway bars was included on the build for this Defender and all new bushings and links were done. 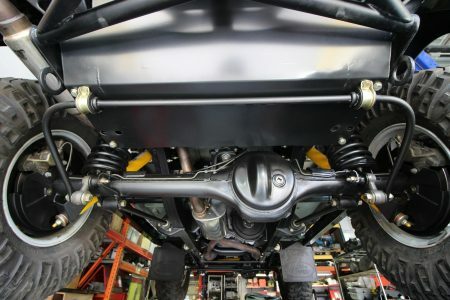 New front tie rod ends, drop arm kit and front radius arm bushings. 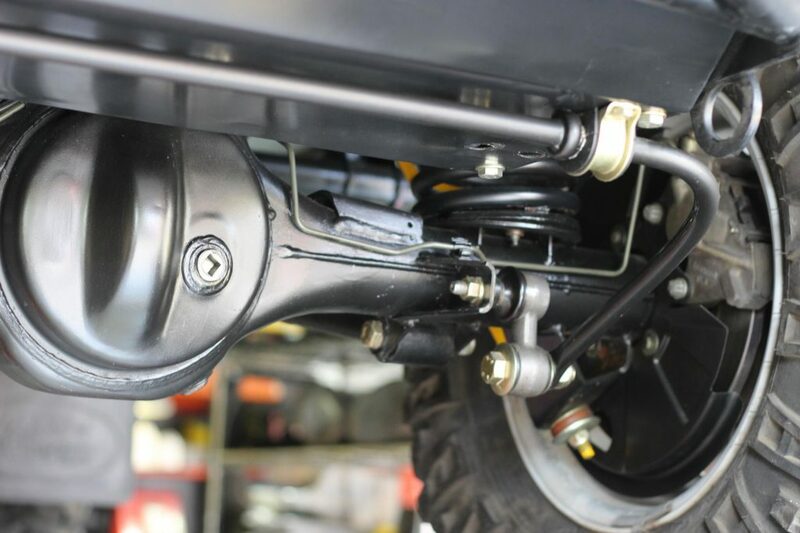 New rear trail link bushings and rear radius arm bushings. The brake system features front 4 piston calipers with vented rotors and rear 2 piston calipers with solid rotors. 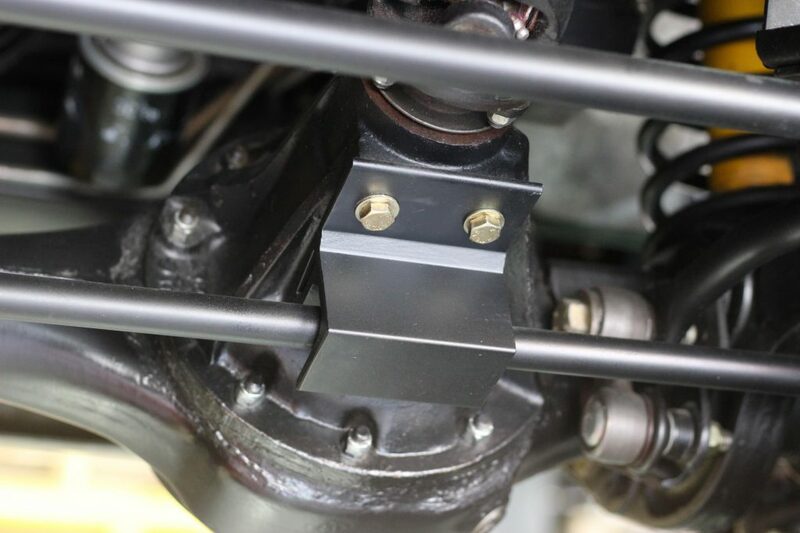 The brake calipers are the original Lockheed calipers with the original casting and date stamping but the calipers have been completely overhauled and rebuilt. 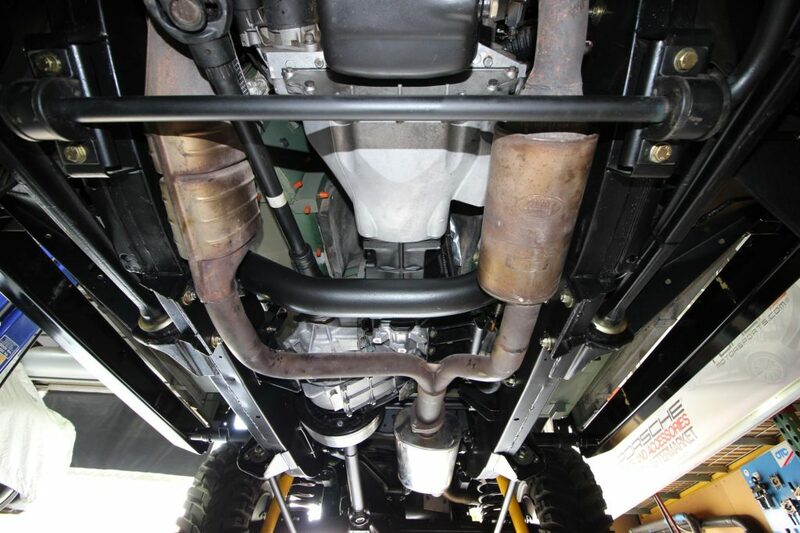 New brake flex lines front and rear and an upgraded steel braided rear flex line installed. 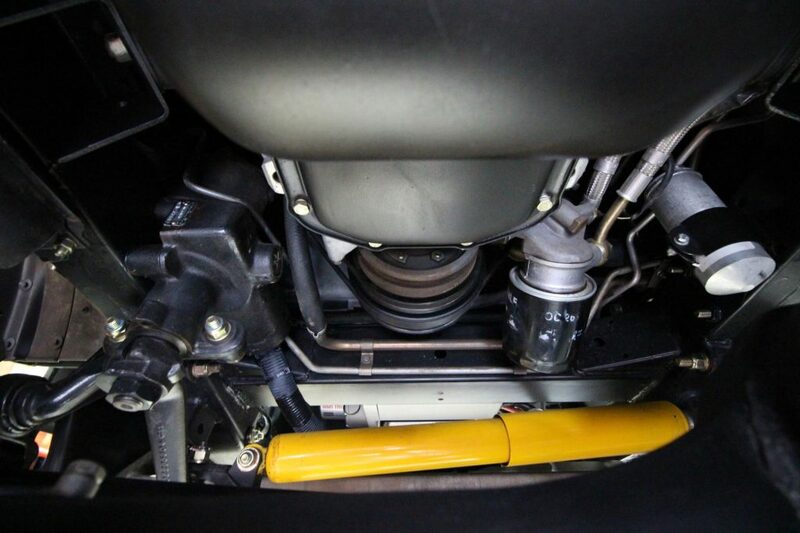 All brake fluid was flushed from the system and replaced with new DOT4 fluid. 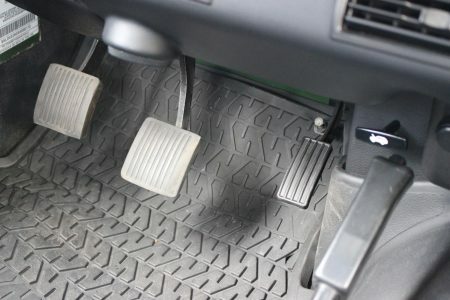 New brake pads and brake discs front and rear. 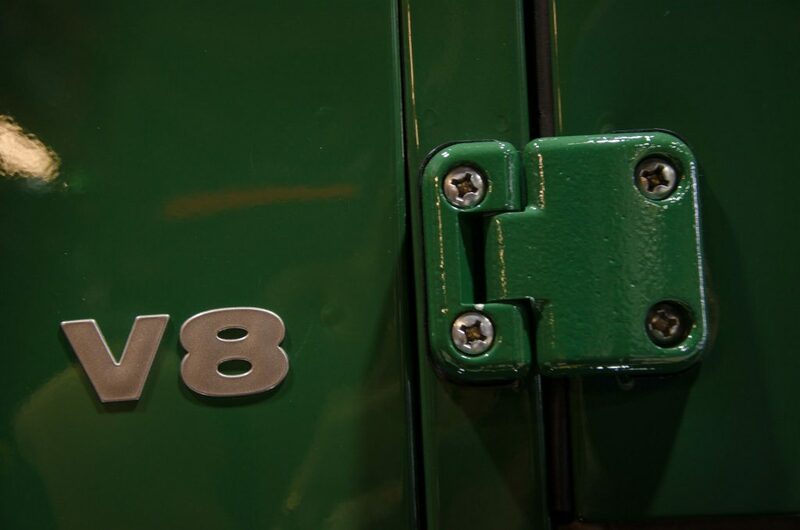 The engine is the original 3.9L V8 matching numbers. 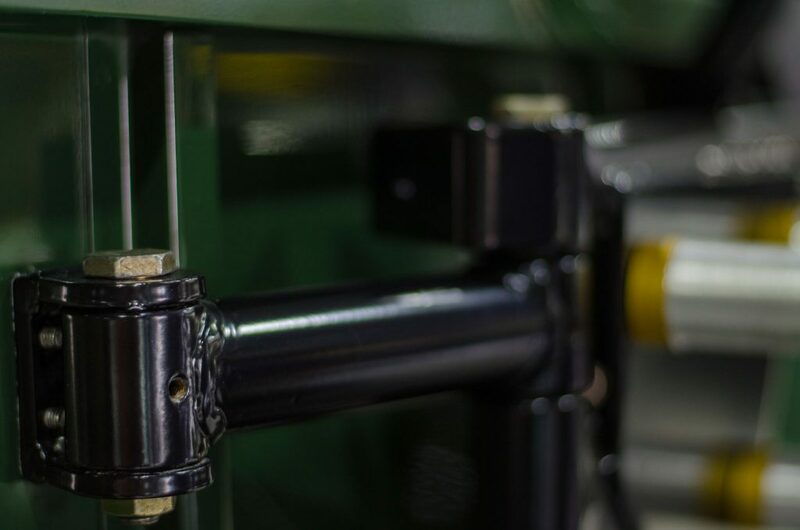 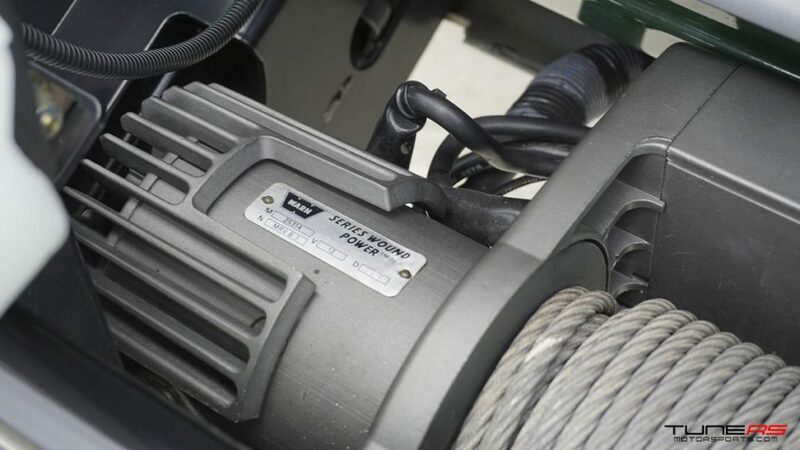 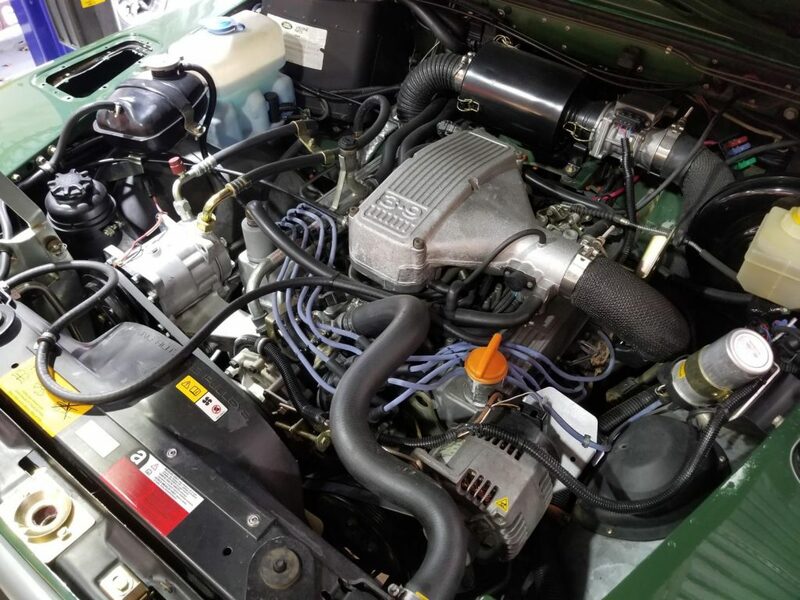 It has been thoroughly inspected including a cylinder leak down test with results of less than 4% across all cylinders indicating a good sealed motor. New water pump, thermostat, hoses and coolant flushed through the system. 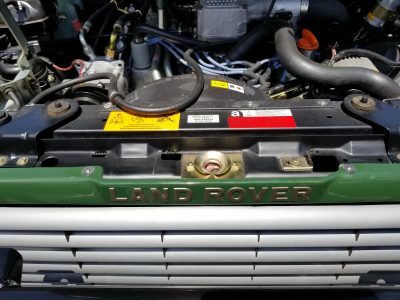 The radiator was removed sent for inspection and re-seal before installing a new radiator fan. 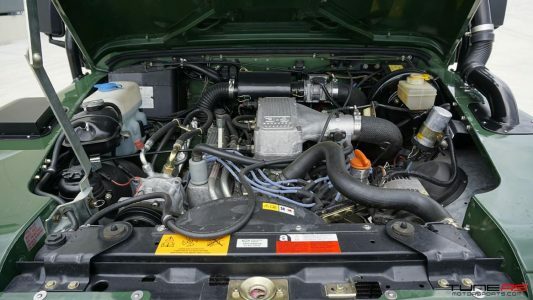 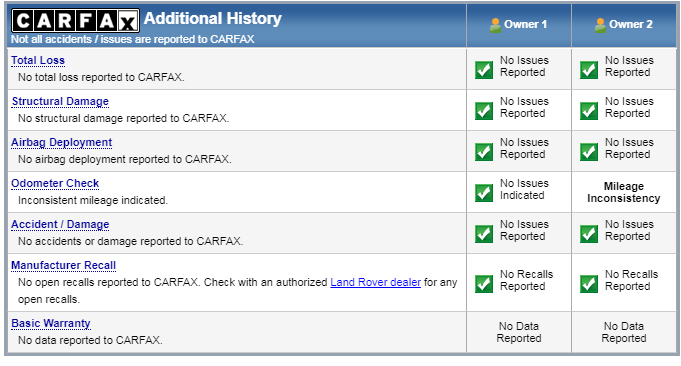 All major services including spark plugs, central ignition coil, drive belts, air filter, fuel filter have been done. 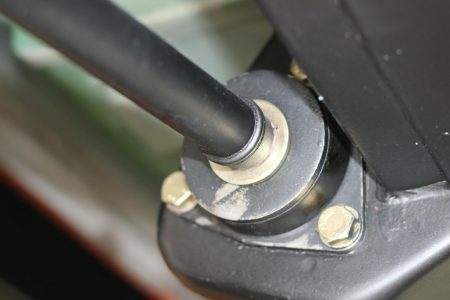 A new tensioner pulley was also replaced for the drive belt due to age. 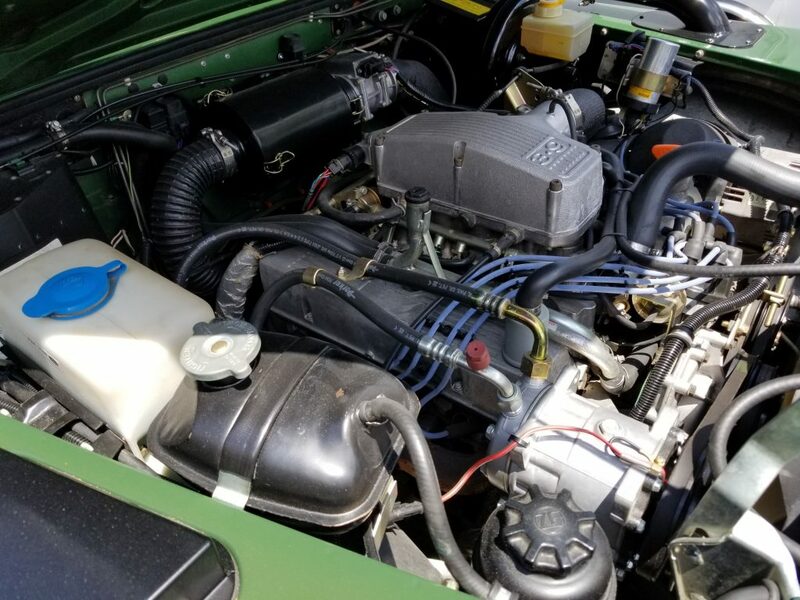 The intake manifold was removed and cleaned and reinstalled with all new gaskets. 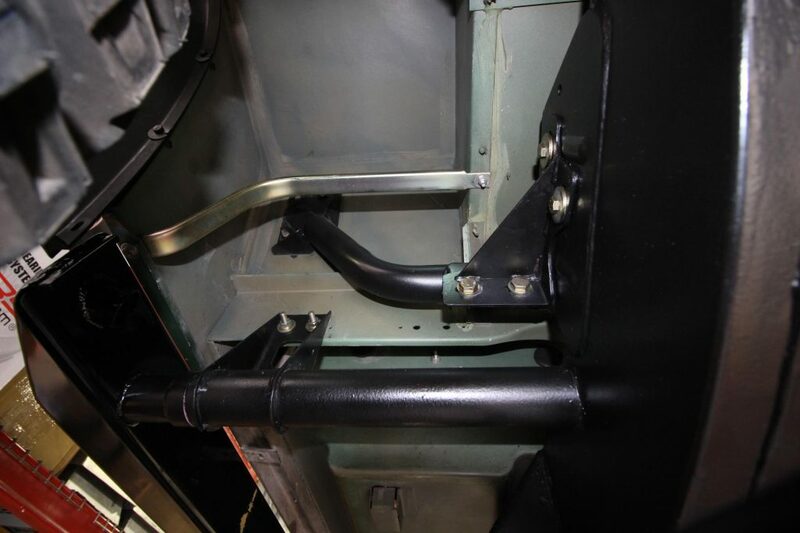 A new oil separator and flame trap were also installed due to age. 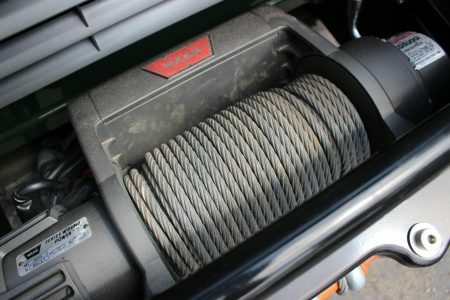 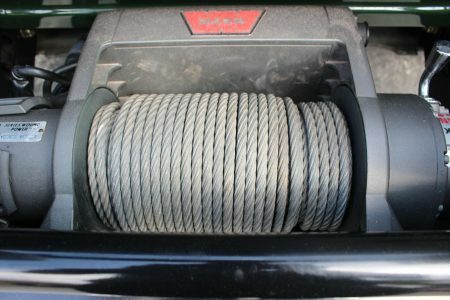 The oil filter housing lines were also upgraded to the better steel braided version. 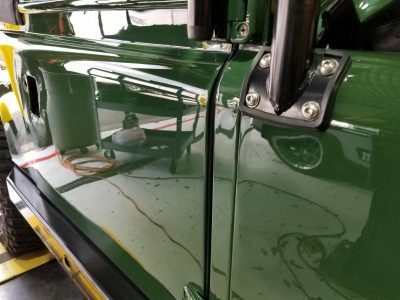 The original lines are known for failing and creating major issues, so this was something that was not overlooked during the restoration. 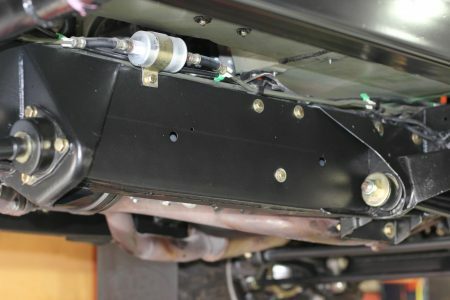 All of the wiring that is normally left exposed or hardly protected by factory was removed and cleaned and reinstalled with new protective sleeves. 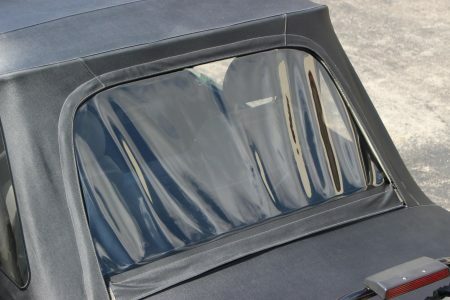 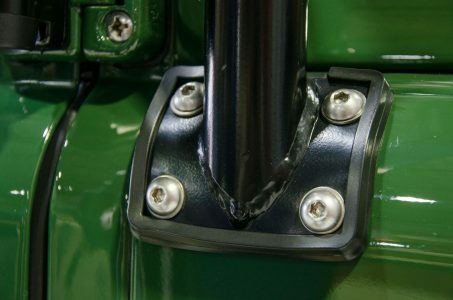 Not only does this create a much cleaner look it also provides protection to the wiring to prevent any possible issues. 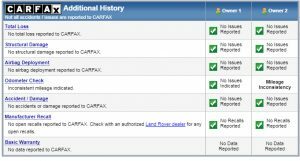 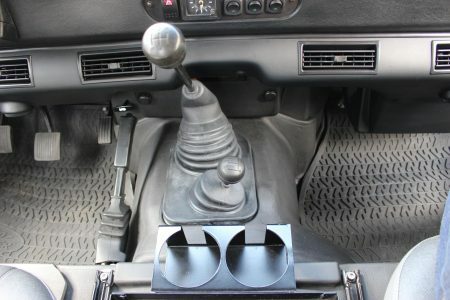 The transmission is the original R380 5 speed manual. The transmission was removed and a new clutch disc, pressure plate, release bearing and hardware were installed. 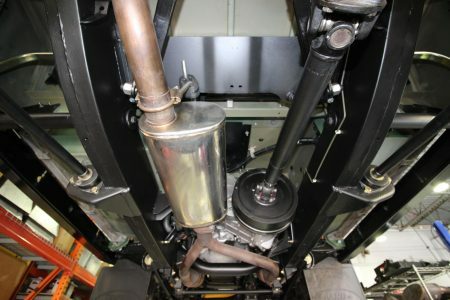 A new rear main seal was also done as well as the shaft seal on the transmission all using genuine Land Rover parts. The transmission housing was also completely cleaned on the exterior and refreshed with the correct black color paint on the center section. The fluid was drained and new fluid installed. The front and rear differentials are factory locking type. 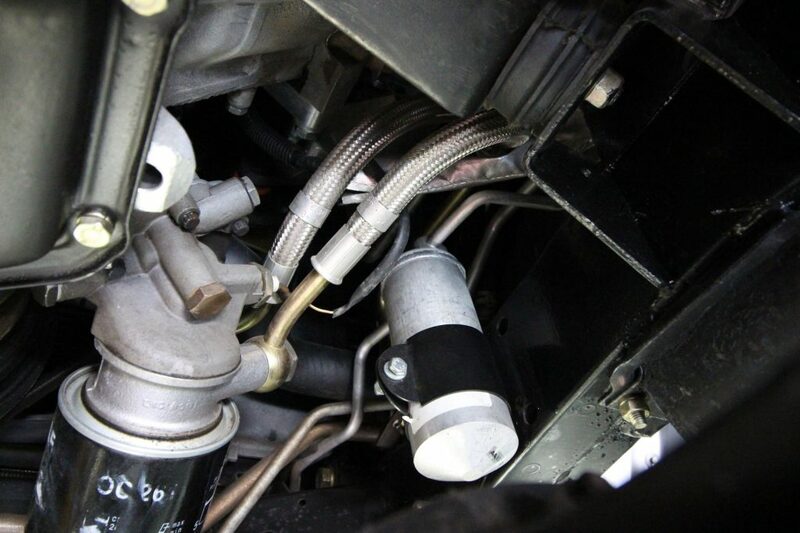 Both differentials were opened, inspected & cleaned and re-sealed and new fluid for both. 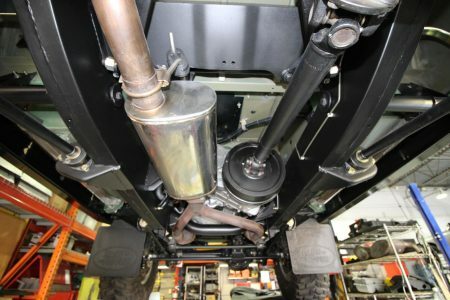 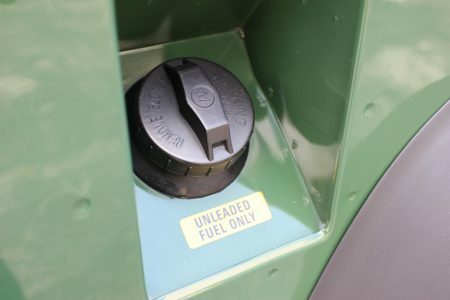 The fuel system was overhauled completely including tank removal to replace fuel tank seals. The tank was also cleaned out and inspected and deemed perfect before reinstalling. 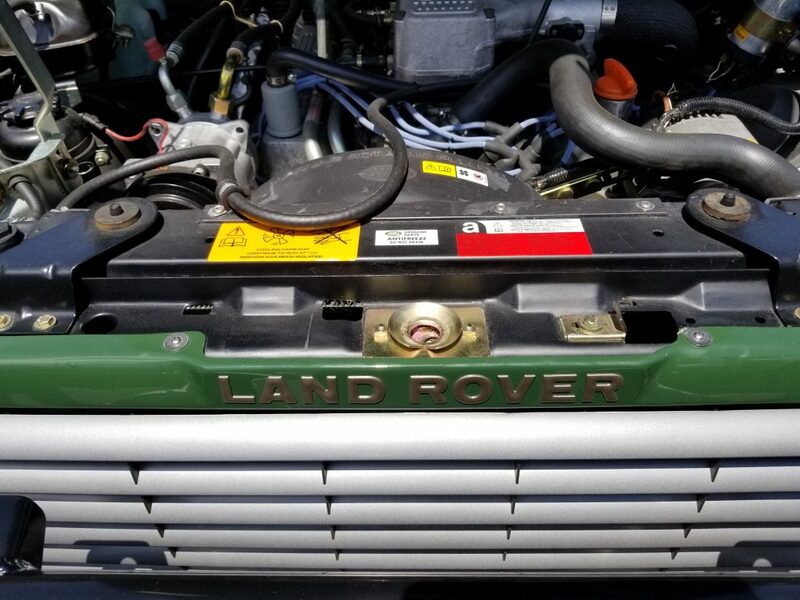 Fuel injectors were serviced and a new fuel filter replaced. 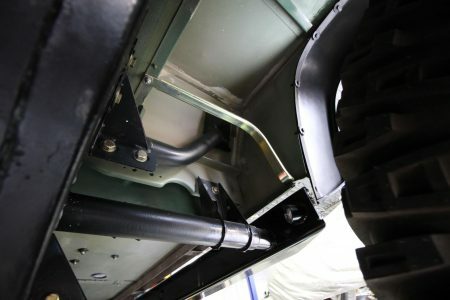 All of the rubber fuel lines were also replaced due to age. 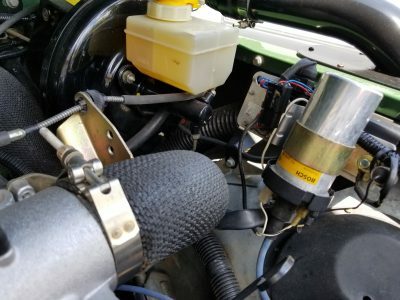 The fuel pump seals were also done during this service. The exhaust system is a stainless steel NRP performance system that includes catalytic converters, pipes and center muffler to rear tip. Besides an increase in horsepower and torque the stainless will be corrosion resistant for years and outperform the original system. 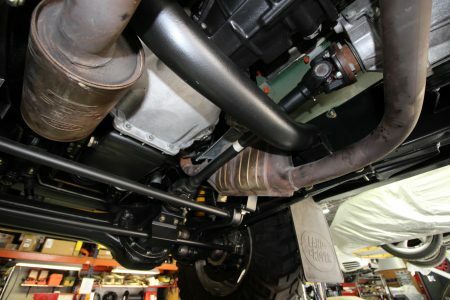 The exhaust note is also much deeper and gives a nice throaty V8 sound without being excessive. 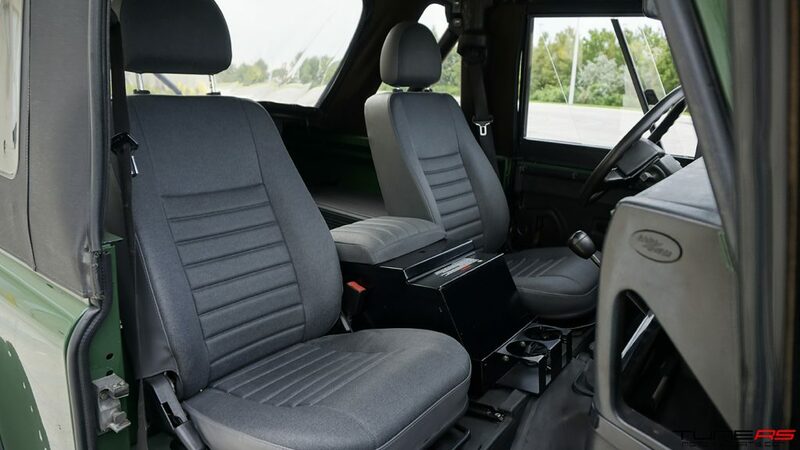 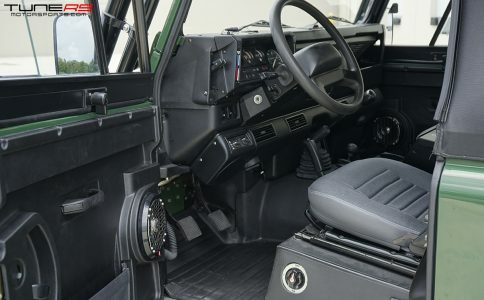 The whole interior was completely removed from the Defender, including the dashboard. 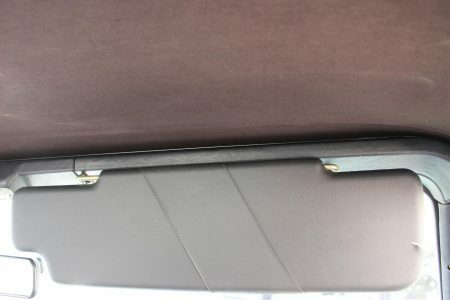 This was done to inspect the floor boards from the top as well as the structure of the body to ensure no major problems. 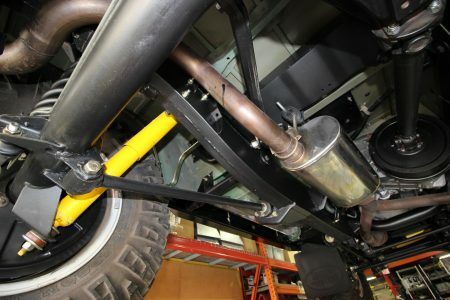 The entire body on the interior does not have a single spot of rust, repair or physical damage. Completely straight and clean. 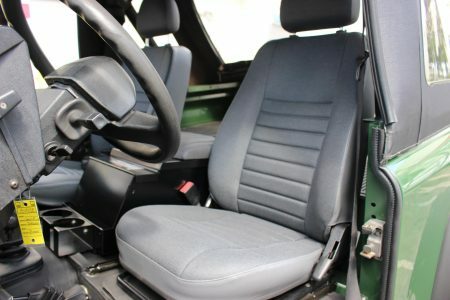 Both front seats were replaced with brand new seats from a newer PUMA. 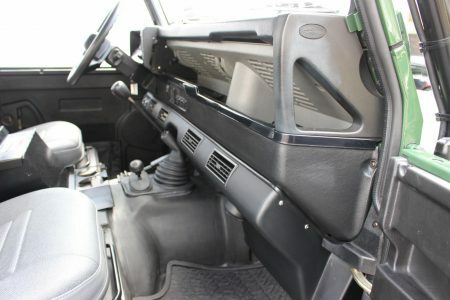 The driver seat lower section was modified to make it easier to access the battery panel, something the old seats made difficult to do. The original rear bench seat is removable to allow more room for cargo to be carried when the canvas top is not in use. 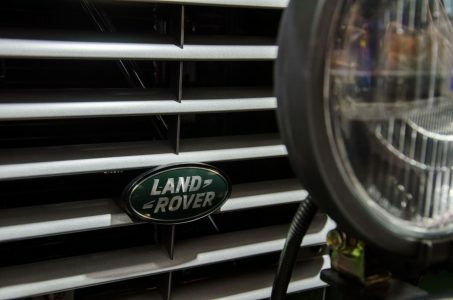 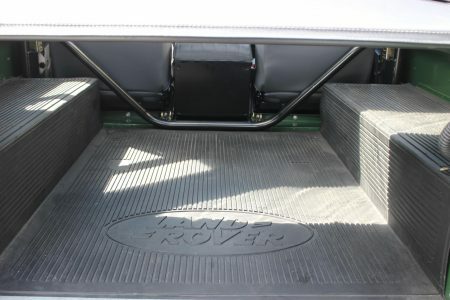 The original rust-free floor panels were cleaned and protected before the new 3 piece molded rubber floor was installed on the front and a 1 piece Genuine molded rear rubber floor mat with Land Rover logo. The 2K clear ensures good paint protection and corrosion protection for years to come and a perfect finish. 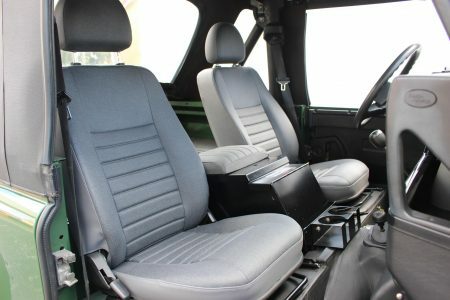 All of the hardware on the interior was also replaced with stainless, again thinking with regards to corrosion protection and appearance. 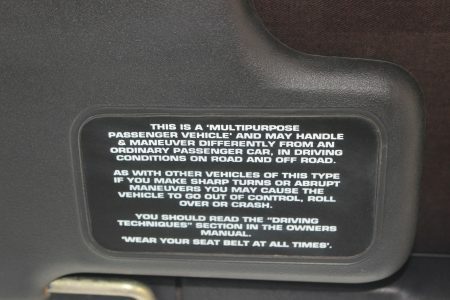 The instrument cluster is the original from the vehicle verified with the date of manufacture as well as the proper font style on the numbers. 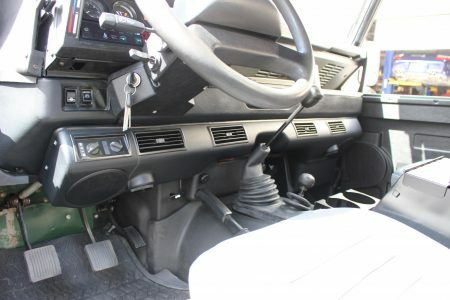 All functions on the cluster are working as original. The dashboard is the original with a grey color finish. No cracks or damage and perfect fitment all around. 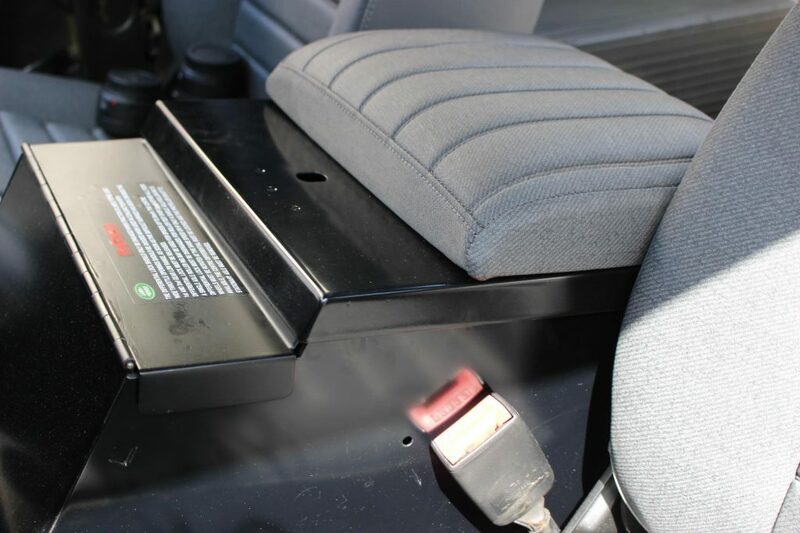 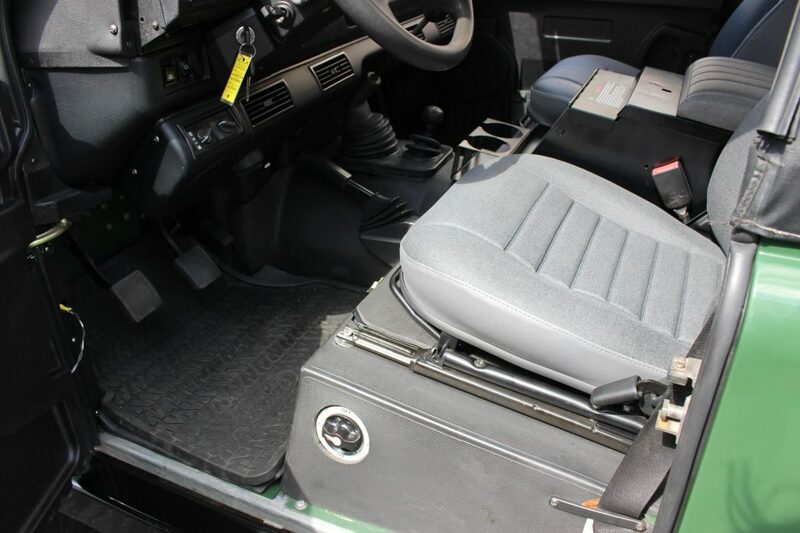 The center console is a Tuffy brand locking security style that also has the radio integrated and two cup holders. The top cushion was custom made with the original fabric from the original seats to match. The storage box with security lock is a nice option to have and will deter any thieves from attempting to gain access to valuable goods that may be stored inside. 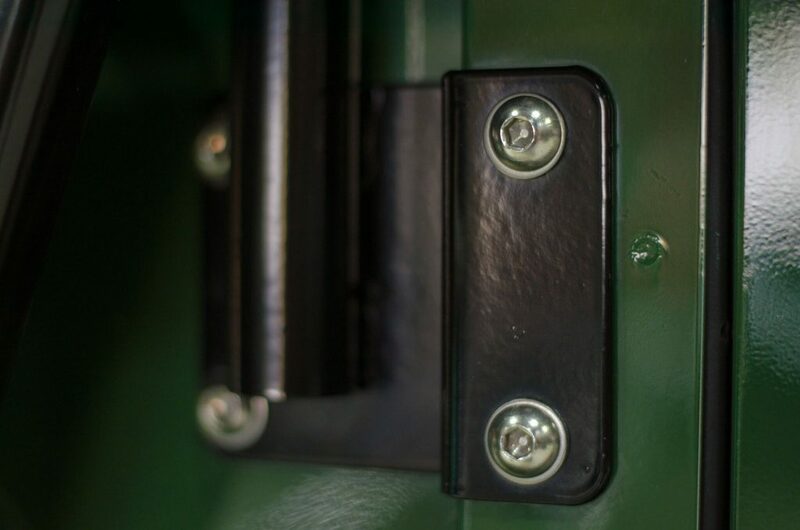 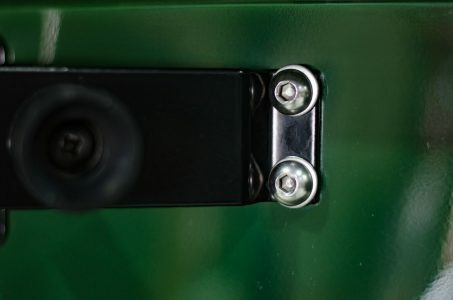 It is equipped with a ¼” steel latch which enables the lid to be latched without locking, a two point welded ½” solid steel striker, grade 8 mounting hardware, durable powder coat (satin black) and stereo mounting compartment. 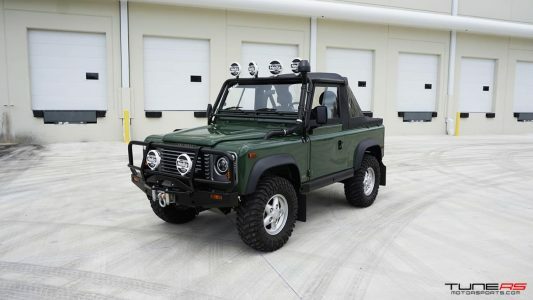 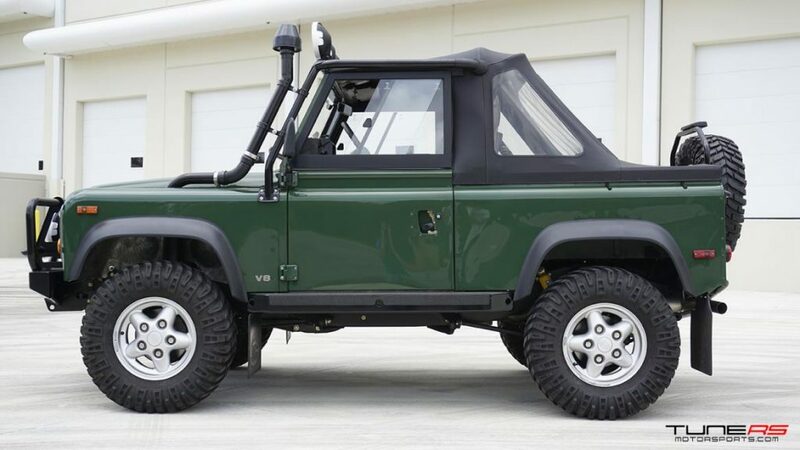 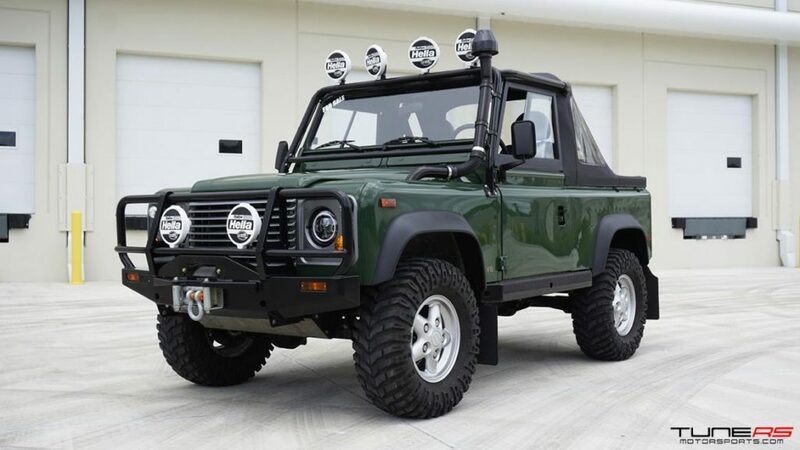 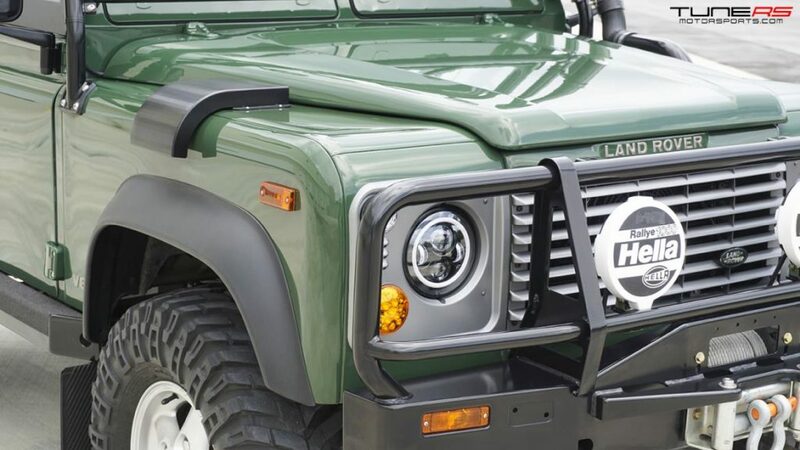 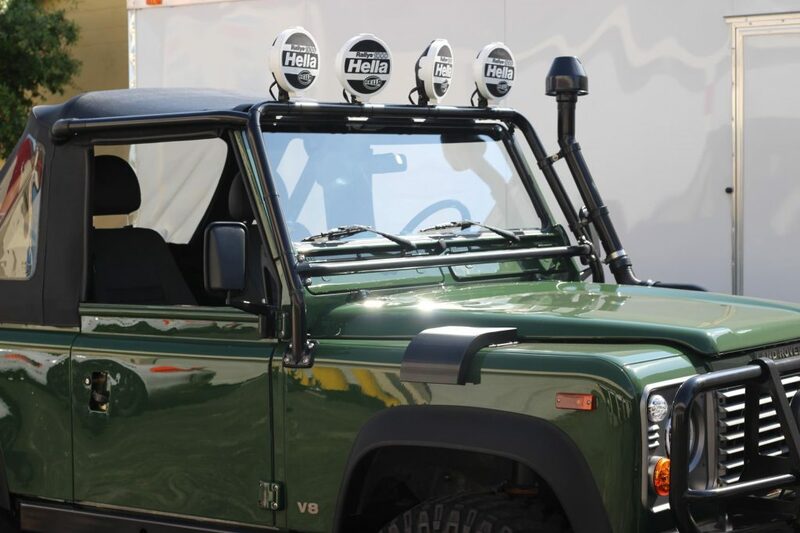 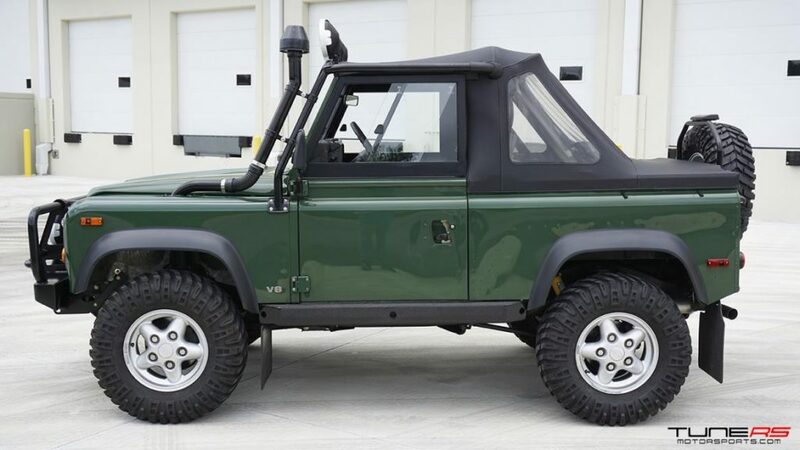 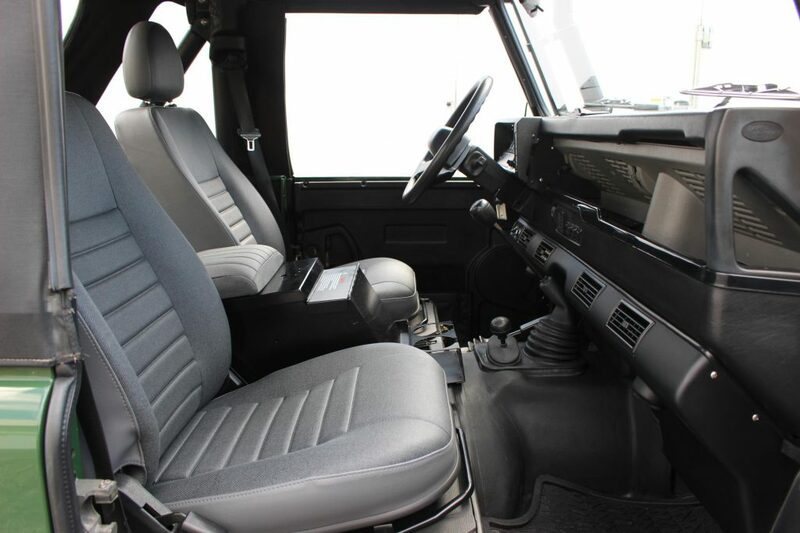 This specific Defender 90 did not originally come with A/C as an option when ordered new. 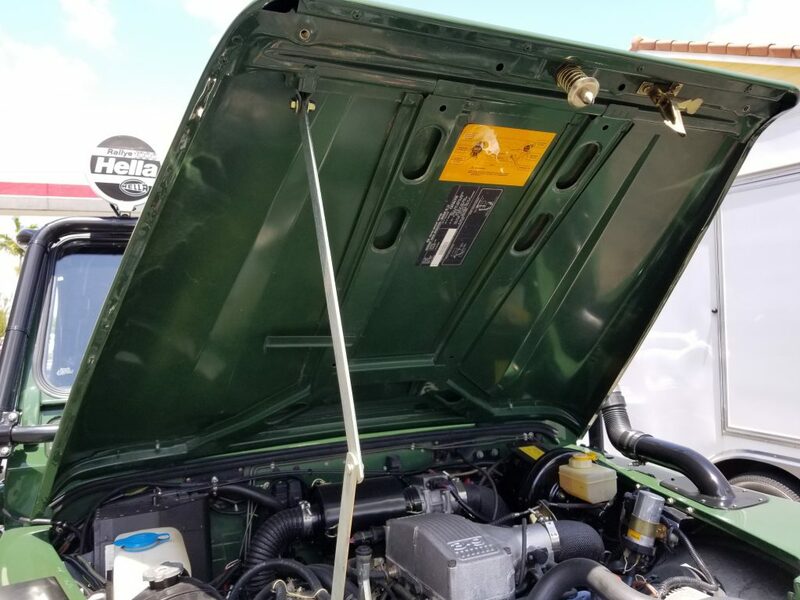 However, the A/C was an option we sought to have for this being that the truck currently resides in Florida and hot weather is unavoidable. 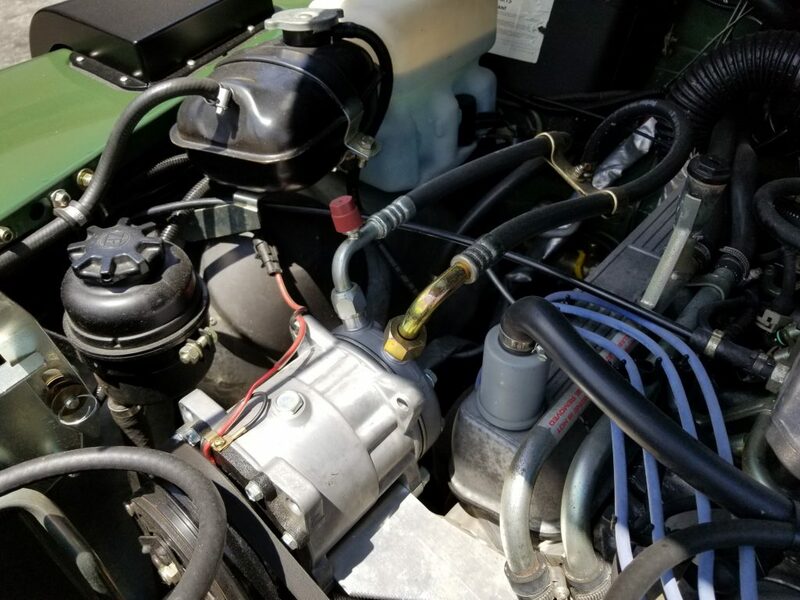 We installed a factory look A/C system with new compressor, new HVAC hoses, new receiver dryer, new condenser, new evaporator and new dashboard ventilation system. It bolts to the factory A/C mounting points and works identical to that of the factory system. 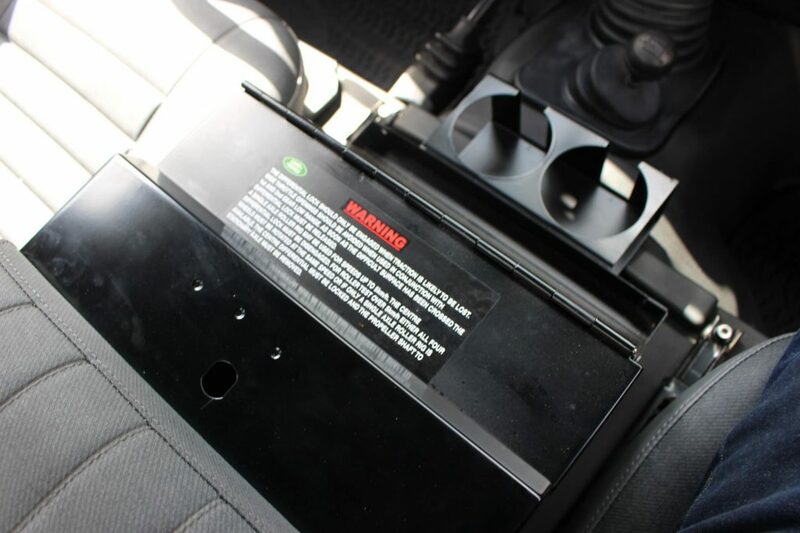 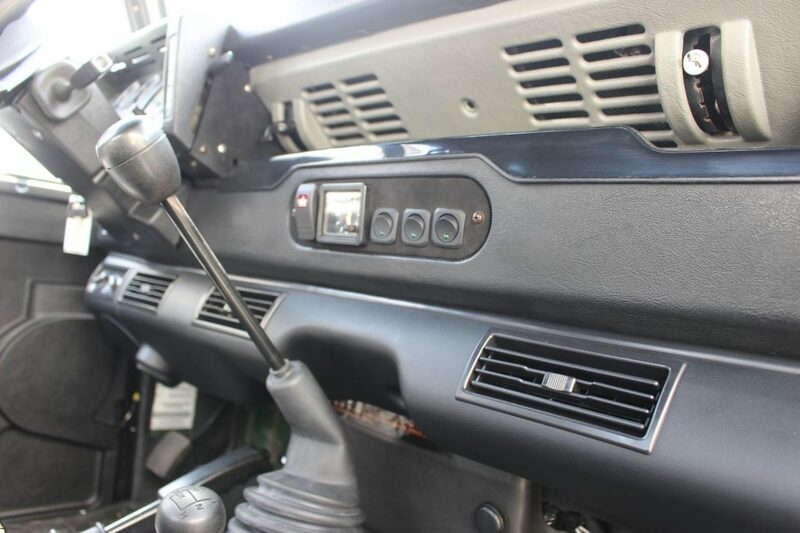 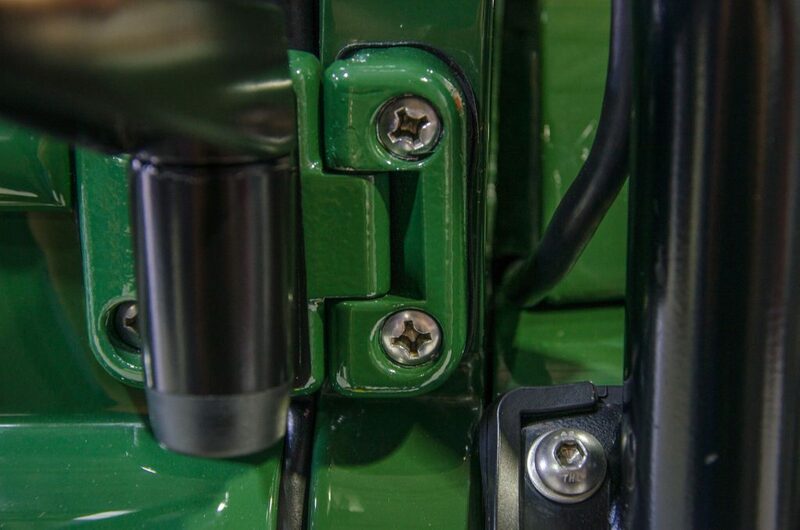 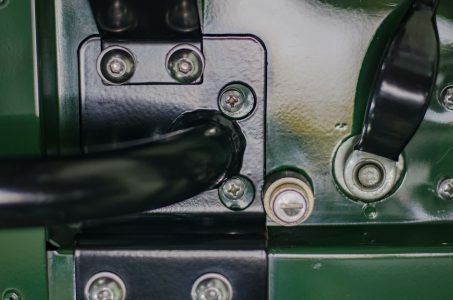 A dual battery setup is installed on this Defender 90, located below the driver seat. 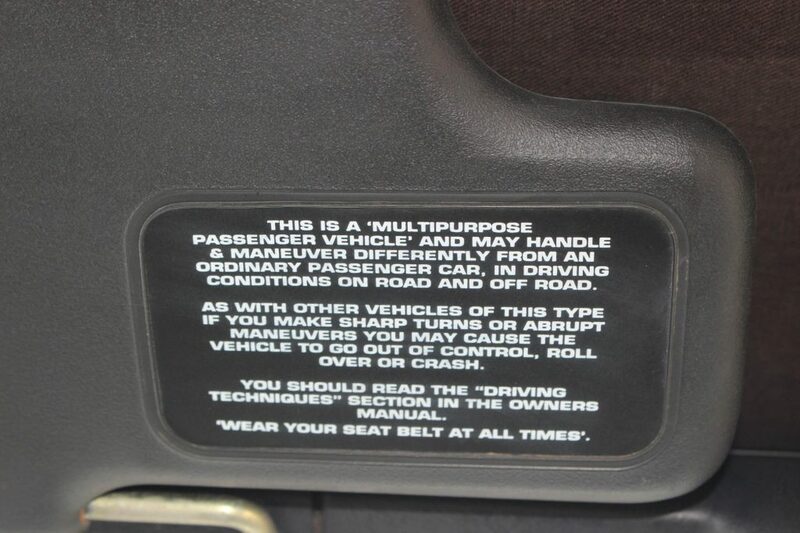 A marine grade kill switch and battery select was also installed on the left side of the driver seat for easy access. 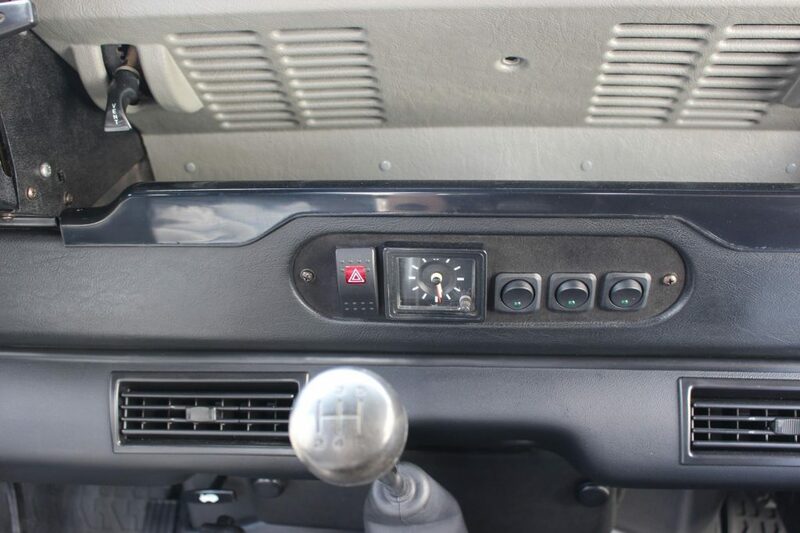 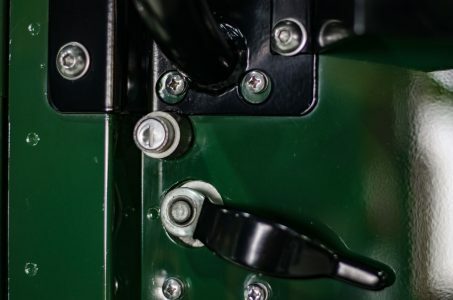 Having this dual battery selection switch allows the vehicle to be utilized when the engine is off without draining the main battery for engine start. The second battery is used as an accessory battery for camping or other purposes and can be switched back to battery 1 to crank the vehicle. It can also be set to both batteries to be charged while engine is operating. The center dash features a custom panel with integrated factory clock and three switches that control the Hella exterior lights. Factory 5-speed shifter with new rubber boot and differential selector knob with new rubber boot. Steering wheel and horn button is the original in like new condition. A brand new Sony MEX-GS820BT bluetooth radio was installed coupled with four new Marine grade Rockford speakers and a Marine grade Rockford subwoofer, all in the original speaker boxes and original rear woofer box. 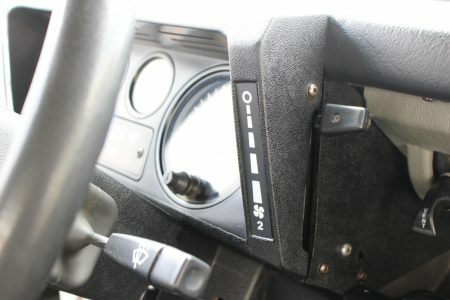 This also has USB connection as well as an auxiliary port and will connect to any Android or Iphone smart phone for hands free use.